Blankwitz ist ein fiktiver Stadtteil der (ebenfalls fiktiven) Großstadt Dembach. Blankwitz is a fictional suburb of the city of Dembach (which is also fictional). line R98 on this map. Mit einiger Verspätung ist Blankwitz jetzt endlich online. Mancher hat die Karte ja schon anderweitig im Netz gefunden, aber jetzt gibt es sie hier auch ganz offiziell. Bitte beachtet, dass ihr die aktuellste Version der Bad Karlstein Objekte ( mindestens 3.1 ) habt, ansonsten geht es nicht. Leider habe ich sehr viel anderes zu tun, daher kann ich nur eingeschränkt Support leisten. Das Komplettpaket, das die Readme verspricht ( "16C" ), folgt noch. Viel Spaß und gute Fahrt! 1. Alles, was benötigt wird, installieren. 2. Laut Logfile fehlende Texturdateien erstellen ( der Inhalt dürfte egal sein ). 3. alle *.o3d.hole Dateien löschen und Map einmal im Editor starten. 4. Wenn der Fehler immernoch auftritt, entweder Beitrag 78 oder Beitrag 128. Edited 5 times, last by Waldheini12 ( Dec 11th 2016 ). 1013 18:43:16 - - Error: You want to create vehicle Vehicles\A3\A3L_82_K.ovh - it is invalid! 1017 18:43:17 - - Error: Fahrzeug Trains\W12_Blankwitz_Metro.zug hat keine Achsen! 1018 18:43:19 - - Error: Fahrzeug Trains\W12_Blankwitz_Metro.zug hat keine Achsen! Ich danke dir für die Map und deine Einstellung zum Copyright! Die Map ist sehr gut geworden - sehr liebevoll gestaltet, auch wenn manch eine Kreuzung ein wenig eng ist! Habe Maptools drüber laufen lassen, sagt fehlt nichts. Sehe manche Straßen trotzdem nicht. 40 19:46:06 - - Warning: Did not find texture file "30er_reihensiedlung01.bmp"! 41 19:46:06 - - Warning: Did not find texture file "SD_Rad_v.bmp"! 42 19:46:06 - - Warning: Did not find texture file "reifen.bmp"! 58 19:46:09 - - Warning: Did not find texture file "path_car_1.bmp"! 61 19:46:23 - - Warning: Did not find texture file "texture.tga"! 62 19:46:23 - - Warning: Did not find texture file "Snow_1.bmp.001"! 72 19:46:27 - - Error: The file "Sceneryobjects\Waldheini12\Blankwitz\StreetSystem\texture\Fussweg.bmp.cfg" could not be loaded! 73 19:46:27 - - Error: The file "Sceneryobjects\Waldheini12\Blankwitz\StreetSystem\texture\Pflaster_alt.bmp.cfg" could not be loaded! 83 19:46:38 - - Warning: Line "maps\Blankwitz\TTData\28-29.ttl", tour 5011: Entry 24 begins before previous entry ends! 86 19:46:38 - - Warning: Cloudtype "-1" could not be found! 89 19:46:38 - - Information: maps\Blankwitz\global.cfg map loaded! 91 19:46:40 - - Warning: Did not find texture file "WegweiserChange.dds"! 92 19:46:40 - - Warning: Did not find texture file "WegweiserChange.dds"! 93 19:46:40 - - Warning: Did not find texture file "text.bmp"! 94 19:46:40 - - Warning: Did not find texture file "text.bmp"! 100 19:46:41 - - Error: The file "Sceneryobjects\Waldheini12\Blankwitz\StreetSystem\texture\WEN_Tile_Asphalt1A.dd.cfg" could not be loaded! 101 19:46:41 - - Warning: Did not find texture file "textfeld.bmp"! 102 19:46:41 - - Warning: Did not find texture file "WegweiserChange.dds"! 103 19:46:41 - - Warning: Did not find texture file "WegweiserChange.dds"! 105 19:46:42 - - Warning: Did not find texture file "text.tga"! 106 19:46:42 - - Warning: Did not find texture file "text.tga"! 108 19:46:43 - - Warning: Did not find texture file "Werbung.dds"! 109 19:46:43 - - Warning: Did not find texture file "Werbung.dds"! 110 19:46:43 - - Warning: Did not find texture file "logo_test.dds"! 111 19:46:43 - - Warning: Did not find texture file "logo_test.dds"! 112 19:46:43 - - Warning: Did not find texture file "logo_test.dds"! 113 19:46:43 - - Warning: Did not find texture file "logo_test.dds"! 114 19:46:43 - - Warning: Did not find texture file "logo_test.dds"! 115 19:46:43 - - Warning: Did not find texture file "logo_test.dds"! 116 19:46:43 - - Warning: Did not find texture file "StrSchild_Text1.bmp"! 117 19:46:43 - - Warning: Did not find texture file "StrSchild_Text1.bmp"! 118 19:46:44 - - Warning: Did not find texture file "textfeld.bmp"! 119 19:46:44 - - Warning: Did not find texture file "textfeld.bmp"! 120 19:46:44 - - Warning: Did not find texture file "textfeld.bmp"! 121 19:46:44 - - Warning: Did not find texture file "textfeld.bmp"! 122 19:46:44 - - Warning: Did not find texture file "WegweiserChange.dds"! 123 19:46:44 - - Warning: Did not find texture file "WegweiserChange.dds"! 124 19:46:44 - - Warning: Did not find texture file "text.bmp"! 125 19:46:44 - - Warning: Did not find texture file "text.bmp"! 126 19:46:44 - - Warning: Did not find texture file "text.bmp"! 128 19:46:46 - - Warning: Did not find texture file "Dach.jpg"! 129 19:46:47 - - Warning: Did not find texture file "logo_default.dds"! 130 19:46:47 - - Warning: Did not find texture file "logo_default.dds"! 131 19:46:47 - - Warning: Did not find texture file "logo_test.dds"! 132 19:46:47 - - Warning: Did not find texture file "logo_test.dds"! 142 19:47:13 - - Warning: Did not find texture file "Textfeld_Thermo.tga"! 143 19:47:13 - - Warning: Did not find texture file "IBIS2-Textfeld.tga"! 149 19:47:17 - - Information: Gamecontrol Logitech Driving Force GT USB: the force feedback steer wheel center effect could not be started! 150 19:47:17 - - Information: Gamecontrol Logitech Driving Force GT USB: the force feedback steer wheel friction effect could not be started! 151 19:47:17 - - Information: Gamecontrol Logitech Driving Force GT USB: the force feedback steer wheel friction effect could not be started! 152 19:47:17 - - Warning: Direct3D-Device lost! 153 19:47:17 - - Information: Direct3D-Device resetted! 158 19:47:47 - - Warning: Did not find texture file "HH109_Kennz.bmp"! 159 19:47:47 - - Warning: Did not find texture file "HH109_Kennz.bmp"! 160 19:47:47 - - Warning: Did not find texture file "HH109_Kennz.bmp"! 161 19:47:47 - - Warning: Did not find texture file "HH109_Kennz.bmp"! 162 19:47:47 - - Warning: Did not find texture file "HH109_Kennz.bmp"! 163 19:47:48 - - Warning: Did not find texture file "HH109_Kennz.bmp"! 164 19:47:48 - - Warning: Did not find texture file "HH109_Kennz.bmp"! 165 19:47:48 - - Warning: Did not find texture file "HH109_Kennz.bmp"! 166 19:47:48 - - Warning: Did not find texture file "HH109_Kennz.bmp"! 167 19:47:48 - - Warning: Did not find texture file "HH109_Kennz.bmp"! 173 19:48:26 - - Information: Actual map closed! Das selbe Problem hab ich auch. Außerdem schneidet der Tunnel nicht in das Gelände, weswegen der Tunneleingang verschlossen ist. 40 19:51:18 - - Warning: Did not find texture file "30er_reihensiedlung01.bmp"! 41 19:51:18 - - Warning: Did not find texture file "SD_Rad_v.bmp"! 42 19:51:18 - - Warning: Did not find texture file "reifen.bmp"! 58 19:51:23 - - Warning: Did not find texture file "path_car_1.bmp"! 61 19:52:14 - - Warning: Did not find texture file "texture.tga"! 62 19:52:14 - - Warning: Did not find texture file "Snow_1.bmp.001"! 72 19:52:18 - - Error: The file "Sceneryobjects\Waldheini12\Blankwitz\StreetSystem\texture\Fussweg.bmp.cfg" could not be loaded! 73 19:52:18 - - Error: The file "Sceneryobjects\Waldheini12\Blankwitz\StreetSystem\texture\Pflaster_alt.bmp.cfg" could not be loaded! 83 19:52:29 - - Warning: Line "maps\Blankwitz\TTData\28-29.ttl", tour 5011: Entry 24 begins before previous entry ends! 86 19:52:29 - - Warning: Cloudtype "-1" could not be found! 89 19:52:29 - - Information: maps\Blankwitz\global.cfg map loaded! 91 19:52:30 - - Error: The file "Sceneryobjects\Waldheini12\Blankwitz\StreetSystem\texture\WEN_Tile_Asphalt1A.dd.cfg" could not be loaded! 92 19:52:30 - - Warning: Did not find texture file "textfeld.bmp"! 93 19:52:30 - - Warning: Did not find texture file "WegweiserChange.dds"! 94 19:52:30 - - Warning: Did not find texture file "WegweiserChange.dds"! 95 19:52:30 - - Warning: Did not find texture file "WegweiserChange.dds"! 96 19:52:30 - - Warning: Did not find texture file "WegweiserChange.dds"! 97 19:52:30 - - Warning: Did not find texture file "text.bmp"! 98 19:52:30 - - Warning: Did not find texture file "text.bmp"! 99 19:52:30 - - Warning: Did not find texture file "text.bmp"! 101 19:52:30 - - Warning: Did not find texture file "WegweiserChange.dds"! 102 19:52:30 - - Warning: Did not find texture file "WegweiserChange.dds"! 103 19:52:31 - - Warning: Did not find texture file "WegweiserChange.dds"! 104 19:52:31 - - Warning: Did not find texture file "WegweiserChange.dds"! 106 19:52:31 - - Warning: Did not find texture file "text.bmp"! 107 19:52:31 - - Warning: Did not find texture file "logo_default.dds"! 108 19:52:31 - - Warning: Did not find texture file "logo_default.dds"! 109 19:52:31 - - Warning: Did not find texture file "logo_test.dds"! 110 19:52:31 - - Warning: Did not find texture file "logo_test.dds"! 111 19:52:31 - - Warning: Did not find texture file "logo_test.dds"! 112 19:52:31 - - Warning: Did not find texture file "logo_test.dds"! 113 19:52:31 - - Warning: Did not find texture file "logo_test.dds"! 114 19:52:31 - - Warning: Did not find texture file "logo_test.dds"! 115 19:52:31 - - Warning: Did not find texture file "Werbung.dds"! 116 19:52:31 - - Warning: Did not find texture file "Werbung.dds"! 117 19:52:31 - - Warning: Did not find texture file "textfeld.bmp"! 118 19:52:31 - - Warning: Did not find texture file "textfeld.bmp"! 119 19:52:31 - - Warning: Did not find texture file "textfeld.bmp"! 120 19:52:31 - - Warning: Did not find texture file "textfeld.bmp"! 121 19:52:31 - - Warning: Did not find texture file "textfeld.bmp"! 122 19:52:31 - - Warning: Did not find texture file "textfeld.bmp"! 123 19:52:31 - - Warning: Did not find texture file "textfeld.bmp"! 124 19:52:31 - - Warning: Did not find texture file "StrSchild_Text1.bmp"! 125 19:52:31 - - Warning: Did not find texture file "text.bmp"! 155 19:52:36 - - Warning: Direct3D-Device lost! 156 19:52:36 - - Information: Direct3D-Device resetted! 162 19:52:37 - - Warning: Did not find texture file "HH109_Kennz.bmp"! 163 19:52:38 - - Warning: Did not find texture file "HH109_Kennz.bmp"! 164 19:52:38 - - Warning: Did not find texture file "HH109_Kennz.bmp"! 165 19:52:38 - - Warning: Did not find texture file "HH109_Kennz.bmp"! 166 19:52:38 - - Warning: Did not find texture file "HH109_Kennz.bmp"! 167 19:52:38 - - Warning: Did not find texture file "HH109_Kennz.bmp"! 168 19:52:38 - - Warning: Did not find texture file "HH109_Kennz.bmp"! 169 19:52:38 - - Warning: Did not find texture file "HH109_Kennz.bmp"! 170 19:52:38 - - Warning: Did not find texture file "HH109_Kennz.bmp"! 171 19:53:04 - - Warning: Did not find texture file "HH109_Kennz.bmp"! 172 19:53:23 - - Warning: Did not find texture file "HH109_Kennz.bmp"! 177 19:55:15 - - Information: Mesh Vehicles\HH109_Stadtgelenkbus1999_VHH\model\GN1\GN_Dum_Gelenk_A.o3d did not generate any materials! 178 19:55:15 - - Information: Mesh Vehicles\HH109_Stadtgelenkbus1999_VHH\model\GN1\GN_Dum_Gelenk_B.o3d did not generate any materials! 179 19:55:15 - - Information: Mesh Vehicles\HH109_Stadtgelenkbus1999_VHH\model\GN1\GN_Dum_Gelenk_C.o3d did not generate any materials! 180 19:55:15 - - Information: Mesh Vehicles\HH109_Stadtgelenkbus1999_VHH\model\GN1\GN_Dum_Gelenk_D.o3d did not generate any materials! 181 19:55:16 - - Warning: Did not find texture file "HHAschedule_font.tga"! 182 19:55:16 - - Warning: Did not find texture file "LCD_7-Segment_alpha.bmp"! 183 19:55:16 - - Warning: Did not find texture file "LCD_7-Segment_alpha.bmp"! 184 19:55:16 - - Warning: Did not find texture file "vdv_display.dds"! 185 19:55:16 - - Warning: Did not find texture file "vdv_display.dds"! 186 19:55:17 - - Warning: Did not find texture file "innendecke.bmp"! 187 19:55:17 - - Warning: Did not find texture file "test1_alpha.bmp"! 188 19:55:17 - - Warning: Did not find texture file "Kennz_DtAlt_Alpha.bmp"! 189 19:55:17 - - Warning: Did not find texture file "test1_alpha.bmp"! 190 19:55:22 - - Warning: Did not find texture file "Kennz_DtAlt_Alpha.bmp"! 191 19:55:22 - - Warning: Did not find texture file "Kennz_DtAlt_Alpha.bmp"! 192 19:55:22 - - Warning: Did not find texture file "test1_alpha.bmp"! 194 19:55:58 - - Warning: Did not find texture file "StrSchild_Text1.bmp"! 195 19:55:59 - - Warning: Did not find texture file "StrSchild_Text1.bmp"! 196 19:55:59 - - Warning: Did not find texture file "StrSchild_Text1.bmp"! 211 19:56:10 - - Warning: Did not find texture file "logo_default.dds"! 212 19:56:10 - - Warning: Did not find texture file "logo_default.dds"! 213 19:56:10 - - Warning: Did not find texture file "textfeld.bmp"! 217 19:56:43 - - Warning: Did not find texture file "AnzChange.dds"! 218 19:56:43 - - Warning: Did not find texture file "AnzChange.dds"! 219 19:56:43 - - Warning: Did not find texture file "textfeld.bmp"! 220 19:56:43 - - Warning: Did not find texture file "textfeld.bmp"! 221 19:56:43 - - Warning: Did not find texture file "textfeld.bmp"! 222 19:56:43 - - Warning: Did not find texture file "textfeld.bmp"! 248 19:57:33 - - Warning: Did not find texture file "BABAusf.dds"! 249 19:57:33 - - Warning: Did not find texture file "BABAusf.dds"! 251 19:57:33 - - Warning: Did not find texture file "text.bmp"! 268 19:58:16 - - Warning: Did not find texture file "HH109_Kennz.bmp"! 273 19:58:20 - - Warning: Did not find texture file "BABAusf.dds"! 274 19:58:20 - - Warning: Did not find texture file "BABAusf.dds"! 275 19:58:20 - - Warning: Did not find texture file "text.tga"! 276 19:58:20 - - Warning: Did not find texture file "text.tga"! 305 19:58:47 - - Warning: Did not find texture file "HH109_Kennz.bmp"! 306 19:58:48 - - Warning: Did not find texture file "HH109_Kennz.bmp"! 307 19:58:48 - - Information: Mesh vehicles\HH109_KIPKW7\model\blaulicht1.o3d did not generate any materials! 308 19:58:48 - - Information: Mesh vehicles\HH109_KIPKW7\model\blaulicht2.o3d did not generate any materials! 309 19:58:48 - - Information: Mesh vehicles\HH109_KIPKW7\model\blaulicht3.o3d did not generate any materials! 330 19:58:59 - - Warning: Texture "Sceneryobjects\Oberpfalz 3D\Krummenaab5\texture\Abstergo.dds" failed! 341 19:59:17 - - Warning: Did not find texture file "logo_test.dds"! 342 19:59:17 - - Warning: Did not find texture file "logo_test.dds"! 343 19:59:17 - - Warning: Did not find texture file "logo_test.dds"! 344 19:59:17 - - Warning: Did not find texture file "logo_test.dds"! 345 19:59:17 - - Warning: Did not find texture file "logo_test.dds"! 346 19:59:17 - - Warning: Did not find texture file "logo_test.dds"! 347 19:59:17 - - Warning: Did not find texture file "AnzChange.dds"! 348 19:59:17 - - Warning: Did not find texture file "AnzChange.dds"! 349 19:59:17 - - Warning: Did not find texture file "AnzChange.dds"! 350 19:59:17 - - Warning: Did not find texture file "AnzChange.dds"! 354 19:59:17 - - Warning: Did not find texture file "textfeld.bmp"! 375 19:59:20 - - Warning: Terrain hole cutting: Spline Splines\Waldheini12\Blankwitz\Gehweg_3,3.sli has invalid hole polygon(s)! 386 19:59:21 - - Warning: Did not find texture file "D_wagennummer.bmp"! 387 19:59:22 - - Warning: File Vehicles\Citaro_K\model\model_O530 EEV ZF.cfg: texture filename d_dreck.tga not found in mesh file Vehicles\Citaro_K\model\O530\Wagenkasten.o3d! 388 19:59:24 - - Warning: Did not find texture file "Linienliste_ANX.bmp"! 389 19:59:24 - - Warning: Did not find texture file "Linienliste_ANX.bmp"! 390 19:59:24 - - Warning: Did not find texture file "Drucker-Textfeld.tga"! 391 19:59:24 - - Warning: Did not find texture file "IBIS2-Textfeld.tga"! 392 19:59:24 - - Warning: Did not find texture file "IBIS2-Delay_min.tga"! 393 19:59:24 - - Warning: Did not find texture file "IBIS2-Delay_sec.tga"! 394 19:59:24 - - Warning: Did not find texture file "IBIS2-Delay_state.tga"! 395 19:59:25 - - Warning: Did not find texture file "D_wagennummer.bmp"! 396 19:59:25 - - Warning: Did not find texture file "D_kennzeichen.bmp"! 397 19:59:25 - - Warning: Did not find texture file "LCD-Innenanzeige.bmp"! 400 19:59:25 - - Warning: Soundfile Vehicles\Citaro_K\sound-citaro\SD_lautsprech_rausch.wav does not exist! 401 19:59:25 - - Warning: Soundfile Vehicles\Citaro_K\sound-citaro\SD_lautsprech_Motor@592.wav does not exist! 402 19:59:25 - - Warning: Soundfile Vehicles\Citaro_K\sound-citaro\Matrix_Ziel.wav does not exist! 403 19:59:25 - - Warning: Soundfile Vehicles\Citaro_K\sound-citaro\D_wischerhebel.wav does not exist! 405 19:59:27 - - Warning: Did not find texture file "Tree_Small_09.tga"! 417 19:59:31 - - Warning: Soundfile Vehicles\Citaro_K\sound-citaro\SD_lautsprech_rausch.wav does not exist! 418 19:59:31 - - Warning: Soundfile Vehicles\Citaro_K\sound-citaro\SD_lautsprech_Motor@592.wav does not exist! 419 19:59:31 - - Warning: Soundfile Vehicles\Citaro_K\sound-citaro\Matrix_Ziel.wav does not exist! 420 19:59:31 - - Warning: Soundfile Vehicles\Citaro_K\sound-citaro\D_wischerhebel.wav does not exist! 421 19:59:45 - - Warning: Did not find texture file "Tree_Small_09.tga"! 427 19:59:58 - - Warning: Did not find texture file "Linienlisten\Blankwitz_ANX.jpg"! 465 20:00:59 - - Warning: Did not find texture file "Textfeld_Thermo.tga"! 466 20:00:59 - - Warning: Did not find texture file "IBIS2-Textfeld.tga"! 467 20:01:03 - - Warning: Did not find texture file "HH109_Kennz.bmp"! 468 20:01:03 - - Information: Mesh vehicles\HH109_KIPKW5\model\blaulicht1.o3d did not generate any materials! 469 20:01:03 - - Information: Mesh vehicles\HH109_KIPKW5\model\blaulicht2.o3d did not generate any materials! 473 20:01:04 - - Warning: Terrain file "maps\Blankwitz\tile_14_1.map.terrain" could not be loaded! 475 20:01:06 - - Warning: Did not find texture file "Linienlisten\Blankwitz_ANX.jpg"! 479 20:01:15 - - Warning: Terrain file "maps\Blankwitz\tile_15_1.map.terrain" could not be loaded! 489 20:01:20 - - Information: Actual map closed! Es gibt Tage, da verliert man und es gibt Tage da gewinnen die Anderen. Wie sagt man so schön lieber Arm dran als Arm ab. 40 20:06:10 - - Warning: Did not find texture file "30er_reihensiedlung01.bmp"! 41 20:06:10 - - Warning: Did not find texture file "SD_Rad_v.bmp"! 42 20:06:10 - - Warning: Did not find texture file "reifen.bmp"! 58 20:06:15 - - Warning: Did not find texture file "path_car_1.bmp"! 61 20:06:40 - - Warning: Did not find texture file "texture.tga"! 62 20:06:40 - - Warning: Did not find texture file "Snow_1.bmp.001"! 72 20:06:43 - - Error: The file "Sceneryobjects\Waldheini12\Blankwitz\StreetSystem\texture\Fussweg.bmp.cfg" could not be loaded! 73 20:06:43 - - Error: The file "Sceneryobjects\Waldheini12\Blankwitz\StreetSystem\texture\Pflaster_alt.bmp.cfg" could not be loaded! 83 20:06:45 - - Warning: Line "maps\Blankwitz\TTData\28-29.ttl", tour 5011: Entry 24 begins before previous entry ends! 86 20:06:45 - - Warning: Cloudtype "-1" could not be found! 89 20:06:45 - - Information: maps\Blankwitz\global.cfg map loaded! 90 20:06:46 - - Warning: Did not find texture file "logo_default.dds"! 91 20:06:46 - - Warning: Did not find texture file "logo_default.dds"! 92 20:06:46 - - Warning: Did not find texture file "logo_test.dds"! 93 20:06:46 - - Warning: Did not find texture file "logo_test.dds"! 94 20:06:46 - - Warning: Did not find texture file "logo_test.dds"! 95 20:06:46 - - Warning: Did not find texture file "logo_test.dds"! 96 20:06:46 - - Warning: Did not find texture file "text.bmp"! 101 20:06:47 - - Warning: Did not find texture file "StrSchild_Text1.bmp"! 102 20:06:47 - - Warning: Did not find texture file "StrSchild_Text1.bmp"! 103 20:06:47 - - Warning: Did not find texture file "StrSchild_Text1.bmp"! 104 20:06:47 - - Warning: Did not find texture file "StrSchild_Text1.bmp"! 105 20:06:47 - - Warning: Did not find texture file "text.bmp"! 106 20:06:47 - - Warning: Did not find texture file "text.bmp"! 107 20:06:47 - - Warning: Did not find texture file "text.bmp"! 109 20:06:47 - - Warning: Did not find texture file "Werbung.dds"! 110 20:06:47 - - Warning: Did not find texture file "Werbung.dds"! 112 20:06:48 - - Warning: Did not find texture file "textfeld.bmp"! 113 20:06:48 - - Warning: Did not find texture file "textfeld.bmp"! 114 20:06:48 - - Warning: Did not find texture file "textfeld.bmp"! 115 20:06:48 - - Warning: Did not find texture file "textfeld.bmp"! 116 20:06:48 - - Warning: Did not find texture file "textfeld.bmp"! 117 20:06:48 - - Warning: Did not find texture file "WegweiserChange.dds"! 118 20:06:48 - - Warning: Did not find texture file "WegweiserChange.dds"! 119 20:06:48 - - Warning: Did not find texture file "WegweiserChange.dds"! 120 20:06:48 - - Warning: Did not find texture file "WegweiserChange.dds"! 125 20:06:49 - - Warning: Did not find texture file "logo_test.dds"! 126 20:06:49 - - Warning: Did not find texture file "logo_test.dds"! 128 20:06:50 - - Warning: Did not find texture file "logo_test.dds"! 129 20:06:50 - - Warning: Did not find texture file "logo_test.dds"! 130 20:06:50 - - Warning: Did not find texture file "logo_test.dds"! 131 20:06:50 - - Warning: Did not find texture file "logo_test.dds"! 132 20:06:50 - - Warning: Did not find texture file "logo_test.dds"! 133 20:06:50 - - Warning: Did not find texture file "logo_test.dds"! 134 20:06:50 - - Warning: Did not find texture file "textfeld.bmp"! 135 20:06:50 - - Warning: Did not find texture file "textfeld.bmp"! 136 20:06:50 - - Warning: Did not find texture file "textfeld.bmp"! 137 20:06:50 - - Warning: Did not find texture file "textfeld.bmp"! 138 20:06:50 - - Warning: Did not find texture file "textfeld.bmp"! 139 20:06:50 - - Warning: Did not find texture file "textfeld.bmp"! 140 20:06:50 - - Warning: Did not find texture file "textfeld.bmp"! 141 20:06:50 - - Warning: Did not find texture file "WegweiserChange.dds"! 142 20:06:50 - - Warning: Did not find texture file "WegweiserChange.dds"! 143 20:06:50 - - Warning: Did not find texture file "WegweiserChange.dds"! 144 20:06:50 - - Warning: Did not find texture file "WegweiserChange.dds"! 145 20:06:50 - - Warning: Did not find texture file "AnzChange.dds"! 146 20:06:50 - - Warning: Did not find texture file "AnzChange.dds"! 147 20:06:50 - - Warning: Did not find texture file "AnzChange.dds"! 148 20:06:50 - - Warning: Did not find texture file "AnzChange.dds"! 149 20:06:50 - - Warning: Did not find texture file "text.bmp"! 152 20:06:50 - - Error: The file "Sceneryobjects\Waldheini12\Blankwitz\StreetSystem\texture\WEN_Tile_Asphalt1A.dd.cfg" could not be loaded! 158 20:06:51 - - Warning: Did not find texture file "textfeld.bmp"! 161 20:06:51 - - Warning: Terrain hole cutting: Spline Splines\Waldheini12\Blankwitz\Gehweg_3,3.sli has invalid hole polygon(s)! 202 20:06:52 - - Warning: Terrain hole cutting: Spline Splines\Waldheini12\Blankwitz\Gehweg_3,3.sli has invalid hole polygon(s)! 204 20:06:52 - - Warning: Terrain hole cutting: Spline Splines\Waldheini12\Blankwitz\Gehweg_3,3.sli has invalid hole polygon(s)! 208 20:06:54 - - Warning: Terrain hole cutting: Spline Splines\Waldheini12\Blankwitz\Gehweg_3,3.sli has invalid hole polygon(s)! 212 20:06:57 - - Error: The file "Vehicles\HH109_Stadtgelenkbus1999_VHH\HHStadtgelenkbus99_main_Krueger+.bus" could not be loaded! 213 20:06:57 - - Error: The file "Vehicles\HH109_Stadtgelenkbus1999_VHH\HHStadtgelenkbus99_main_Krueger+.bus" could not be loaded! 214 20:06:57 - - Warning: Invalid Object: Vehicles\HH109_Stadtgelenkbus1999_VHH\HHStadtgelenkbus99_main_Krueger+.bus"
215 20:06:57 - - Error: You want to create vehicle Vehicles\HH109_Stadtgelenkbus1999_VHH\HHStadtgelenkbus99_main_Krueger+.bus - it is invalid! 217 20:06:57 - - Error: The file "Vehicles\Citaro_K\Citaro_K.bus" could not be loaded! 218 20:06:57 - - Error: The file "Vehicles\Citaro_K\Citaro_K.bus" could not be loaded! 219 20:06:57 - - Warning: Invalid Object: Vehicles\Citaro_K\Citaro_K.bus"
220 20:06:57 - - Error: You want to create vehicle Vehicles\Citaro_K\Citaro_K.bus - it is invalid! 222 20:06:57 - - Error: You want to create vehicle Vehicles\Citaro_K\Citaro_K.bus - it is invalid! 229 20:06:57 - - Error: You want to create vehicle Vehicles\Citaro_K\Citaro_K.bus - it is invalid! 231 20:06:57 - - Error: You want to create vehicle Vehicles\Citaro_K\Citaro_K.bus - it is invalid! 233 20:06:57 - - Error: You want to create vehicle Vehicles\HH109_Stadtgelenkbus1999_VHH\HHStadtgelenkbus99_main_Krueger+.bus - it is invalid! 234 20:06:57 - - Warning: Direct3D-Device lost! 235 20:06:57 - - Information: Direct3D-Device resetted! 241 20:06:58 - - Error: You want to create vehicle Vehicles\Citaro_K\Citaro_K.bus - it is invalid! 243 20:06:58 - - Error: You want to create vehicle Vehicles\Citaro_K\Citaro_K.bus - it is invalid! 245 20:06:58 - - Error: You want to create vehicle Vehicles\HH109_Stadtgelenkbus1999_VHH\HHStadtgelenkbus99_main_Krueger+.bus - it is invalid! 248 20:06:58 - - Error: You want to create vehicle Vehicles\Citaro_K\Citaro_K.bus - it is invalid! 250 20:06:58 - - Error: You want to create vehicle Vehicles\Citaro_K\Citaro_K.bus - it is invalid! 252 20:06:58 - - Error: You want to create vehicle Vehicles\HH109_Stadtgelenkbus1999_VHH\HHStadtgelenkbus99_main_Krueger+.bus - it is invalid! 253 20:07:00 - - Warning: Did not find texture file "HH109_Kennz.bmp"! 254 20:07:00 - - Warning: Did not find texture file "HH109_Kennz.bmp"! 255 20:07:00 - - Warning: Did not find texture file "HH109_Kennz.bmp"! 256 20:07:00 - - Warning: Did not find texture file "HH109_Kennz.bmp"! 257 20:07:00 - - Warning: Did not find texture file "HH109_Kennz.bmp"! 258 20:07:00 - - Warning: Did not find texture file "HH109_Kennz.bmp"! 259 20:07:00 - - Warning: Did not find texture file "HH109_Kennz.bmp"! 260 20:07:00 - - Warning: Did not find texture file "HH109_Kennz.bmp"! 261 20:07:00 - - Warning: Did not find texture file "HH109_Kennz.bmp"! 263 20:07:01 - - Error: You want to create vehicle Vehicles\Citaro_K\Citaro_K.bus - it is invalid! 265 20:07:01 - - Error: You want to create vehicle Vehicles\Citaro_K\Citaro_K.bus - it is invalid! 267 20:07:01 - - Error: You want to create vehicle Vehicles\HH109_Stadtgelenkbus1999_VHH\HHStadtgelenkbus99_main_Krueger+.bus - it is invalid! 269 20:07:01 - - Error: You want to create vehicle Vehicles\Citaro_K\Citaro_K.bus - it is invalid! 271 20:07:01 - - Error: You want to create vehicle Vehicles\Citaro_K\Citaro_K.bus - it is invalid! 273 20:07:01 - - Error: You want to create vehicle Vehicles\HH109_Stadtgelenkbus1999_VHH\HHStadtgelenkbus99_main_Krueger+.bus - it is invalid! 275 20:07:02 - - Error: You want to create vehicle Vehicles\Citaro_K\Citaro_K.bus - it is invalid! 277 20:07:02 - - Error: You want to create vehicle Vehicles\Citaro_K\Citaro_K.bus - it is invalid! 279 20:07:02 - - Error: You want to create vehicle Vehicles\HH109_Stadtgelenkbus1999_VHH\HHStadtgelenkbus99_main_Krueger+.bus - it is invalid! 281 20:07:02 - - Error: You want to create vehicle Vehicles\Citaro_K\Citaro_K.bus - it is invalid! 283 20:07:02 - - Error: You want to create vehicle Vehicles\Citaro_K\Citaro_K.bus - it is invalid! 285 20:07:02 - - Error: You want to create vehicle Vehicles\HH109_Stadtgelenkbus1999_VHH\HHStadtgelenkbus99_main_Krueger+.bus - it is invalid! 287 20:07:03 - - Error: You want to create vehicle Vehicles\Citaro_K\Citaro_K.bus - it is invalid! 289 20:07:03 - - Error: You want to create vehicle Vehicles\Citaro_K\Citaro_K.bus - it is invalid! 291 20:07:03 - - Error: You want to create vehicle Vehicles\HH109_Stadtgelenkbus1999_VHH\HHStadtgelenkbus99_main_Krueger+.bus - it is invalid! 293 20:07:03 - - Error: You want to create vehicle Vehicles\Citaro_K\Citaro_K.bus - it is invalid! 295 20:07:03 - - Error: You want to create vehicle Vehicles\Citaro_K\Citaro_K.bus - it is invalid! 297 20:07:03 - - Error: You want to create vehicle Vehicles\HH109_Stadtgelenkbus1999_VHH\HHStadtgelenkbus99_main_Krueger+.bus - it is invalid! 299 20:07:04 - - Error: You want to create vehicle Vehicles\Citaro_K\Citaro_K.bus - it is invalid! 301 20:07:04 - - Error: You want to create vehicle Vehicles\Citaro_K\Citaro_K.bus - it is invalid! 303 20:07:04 - - Error: You want to create vehicle Vehicles\HH109_Stadtgelenkbus1999_VHH\HHStadtgelenkbus99_main_Krueger+.bus - it is invalid! 305 20:07:04 - - Error: You want to create vehicle Vehicles\Citaro_K\Citaro_K.bus - it is invalid! 307 20:07:04 - - Error: You want to create vehicle Vehicles\Citaro_K\Citaro_K.bus - it is invalid! 309 20:07:04 - - Error: You want to create vehicle Vehicles\HH109_Stadtgelenkbus1999_VHH\HHStadtgelenkbus99_main_Krueger+.bus - it is invalid! 311 20:07:05 - - Error: You want to create vehicle Vehicles\Citaro_K\Citaro_K.bus - it is invalid! 313 20:07:05 - - Error: You want to create vehicle Vehicles\Citaro_K\Citaro_K.bus - it is invalid! 315 20:07:05 - - Error: You want to create vehicle Vehicles\HH109_Stadtgelenkbus1999_VHH\HHStadtgelenkbus99_main_Krueger+.bus - it is invalid! 317 20:07:05 - - Error: You want to create vehicle Vehicles\Citaro_K\Citaro_K.bus - it is invalid! 319 20:07:05 - - Error: You want to create vehicle Vehicles\Citaro_K\Citaro_K.bus - it is invalid! 321 20:07:05 - - Error: You want to create vehicle Vehicles\HH109_Stadtgelenkbus1999_VHH\HHStadtgelenkbus99_main_Krueger+.bus - it is invalid! 323 20:07:06 - - Error: You want to create vehicle Vehicles\Citaro_K\Citaro_K.bus - it is invalid! 325 20:07:06 - - Error: You want to create vehicle Vehicles\Citaro_K\Citaro_K.bus - it is invalid! 327 20:07:06 - - Error: You want to create vehicle Vehicles\HH109_Stadtgelenkbus1999_VHH\HHStadtgelenkbus99_main_Krueger+.bus - it is invalid! 329 20:07:06 - - Error: You want to create vehicle Vehicles\Citaro_K\Citaro_K.bus - it is invalid! 331 20:07:06 - - Error: You want to create vehicle Vehicles\Citaro_K\Citaro_K.bus - it is invalid! 333 20:07:06 - - Error: You want to create vehicle Vehicles\HH109_Stadtgelenkbus1999_VHH\HHStadtgelenkbus99_main_Krueger+.bus - it is invalid! 335 20:07:07 - - Error: You want to create vehicle Vehicles\Citaro_K\Citaro_K.bus - it is invalid! 337 20:07:07 - - Error: You want to create vehicle Vehicles\Citaro_K\Citaro_K.bus - it is invalid! 339 20:07:07 - - Error: You want to create vehicle Vehicles\HH109_Stadtgelenkbus1999_VHH\HHStadtgelenkbus99_main_Krueger+.bus - it is invalid! 341 20:07:07 - - Error: You want to create vehicle Vehicles\Citaro_K\Citaro_K.bus - it is invalid! 343 20:07:07 - - Error: You want to create vehicle Vehicles\Citaro_K\Citaro_K.bus - it is invalid! 345 20:07:07 - - Error: You want to create vehicle Vehicles\HH109_Stadtgelenkbus1999_VHH\HHStadtgelenkbus99_main_Krueger+.bus - it is invalid! 347 20:07:08 - - Error: You want to create vehicle Vehicles\Citaro_K\Citaro_K.bus - it is invalid! 349 20:07:08 - - Error: You want to create vehicle Vehicles\Citaro_K\Citaro_K.bus - it is invalid! 351 20:07:08 - - Error: You want to create vehicle Vehicles\HH109_Stadtgelenkbus1999_VHH\HHStadtgelenkbus99_main_Krueger+.bus - it is invalid! 353 20:07:08 - - Error: You want to create vehicle Vehicles\Citaro_K\Citaro_K.bus - it is invalid! 355 20:07:08 - - Error: You want to create vehicle Vehicles\Citaro_K\Citaro_K.bus - it is invalid! 357 20:07:08 - - Error: You want to create vehicle Vehicles\HH109_Stadtgelenkbus1999_VHH\HHStadtgelenkbus99_main_Krueger+.bus - it is invalid! 359 20:07:09 - - Error: You want to create vehicle Vehicles\Citaro_K\Citaro_K.bus - it is invalid! 361 20:07:09 - - Error: You want to create vehicle Vehicles\Citaro_K\Citaro_K.bus - it is invalid! 363 20:07:09 - - Error: You want to create vehicle Vehicles\HH109_Stadtgelenkbus1999_VHH\HHStadtgelenkbus99_main_Krueger+.bus - it is invalid! 365 20:07:09 - - Error: You want to create vehicle Vehicles\Citaro_K\Citaro_K.bus - it is invalid! 367 20:07:09 - - Error: You want to create vehicle Vehicles\Citaro_K\Citaro_K.bus - it is invalid! 369 20:07:09 - - Error: You want to create vehicle Vehicles\HH109_Stadtgelenkbus1999_VHH\HHStadtgelenkbus99_main_Krueger+.bus - it is invalid! 371 20:07:10 - - Error: You want to create vehicle Vehicles\Citaro_K\Citaro_K.bus - it is invalid! 373 20:07:10 - - Error: You want to create vehicle Vehicles\Citaro_K\Citaro_K.bus - it is invalid! 375 20:07:10 - - Error: You want to create vehicle Vehicles\HH109_Stadtgelenkbus1999_VHH\HHStadtgelenkbus99_main_Krueger+.bus - it is invalid! 377 20:07:10 - - Error: You want to create vehicle Vehicles\Citaro_K\Citaro_K.bus - it is invalid! 379 20:07:10 - - Error: You want to create vehicle Vehicles\Citaro_K\Citaro_K.bus - it is invalid! 381 20:07:10 - - Error: You want to create vehicle Vehicles\HH109_Stadtgelenkbus1999_VHH\HHStadtgelenkbus99_main_Krueger+.bus - it is invalid! 383 20:07:11 - - Error: You want to create vehicle Vehicles\Citaro_K\Citaro_K.bus - it is invalid! 385 20:07:11 - - Error: You want to create vehicle Vehicles\Citaro_K\Citaro_K.bus - it is invalid! 387 20:07:11 - - Error: You want to create vehicle Vehicles\HH109_Stadtgelenkbus1999_VHH\HHStadtgelenkbus99_main_Krueger+.bus - it is invalid! 389 20:07:11 - - Error: You want to create vehicle Vehicles\Citaro_K\Citaro_K.bus - it is invalid! 391 20:07:11 - - Error: You want to create vehicle Vehicles\Citaro_K\Citaro_K.bus - it is invalid! 393 20:07:11 - - Error: You want to create vehicle Vehicles\HH109_Stadtgelenkbus1999_VHH\HHStadtgelenkbus99_main_Krueger+.bus - it is invalid! 395 20:07:12 - - Error: You want to create vehicle Vehicles\Citaro_K\Citaro_K.bus - it is invalid! 397 20:07:12 - - Error: You want to create vehicle Vehicles\Citaro_K\Citaro_K.bus - it is invalid! 399 20:07:12 - - Error: You want to create vehicle Vehicles\HH109_Stadtgelenkbus1999_VHH\HHStadtgelenkbus99_main_Krueger+.bus - it is invalid! 401 20:07:12 - - Error: You want to create vehicle Vehicles\Citaro_K\Citaro_K.bus - it is invalid! 403 20:07:12 - - Error: You want to create vehicle Vehicles\Citaro_K\Citaro_K.bus - it is invalid! 405 20:07:12 - - Error: You want to create vehicle Vehicles\HH109_Stadtgelenkbus1999_VHH\HHStadtgelenkbus99_main_Krueger+.bus - it is invalid! 407 20:07:13 - - Error: You want to create vehicle Vehicles\Citaro_K\Citaro_K.bus - it is invalid! 409 20:07:13 - - Error: You want to create vehicle Vehicles\Citaro_K\Citaro_K.bus - it is invalid! 411 20:07:13 - - Error: You want to create vehicle Vehicles\HH109_Stadtgelenkbus1999_VHH\HHStadtgelenkbus99_main_Krueger+.bus - it is invalid! 413 20:07:13 - - Error: You want to create vehicle Vehicles\Citaro_K\Citaro_K.bus - it is invalid! 415 20:07:13 - - Error: You want to create vehicle Vehicles\Citaro_K\Citaro_K.bus - it is invalid! 417 20:07:13 - - Error: You want to create vehicle Vehicles\HH109_Stadtgelenkbus1999_VHH\HHStadtgelenkbus99_main_Krueger+.bus - it is invalid! 419 20:07:14 - - Error: You want to create vehicle Vehicles\Citaro_K\Citaro_K.bus - it is invalid! 421 20:07:14 - - Error: You want to create vehicle Vehicles\Citaro_K\Citaro_K.bus - it is invalid! 423 20:07:14 - - Error: You want to create vehicle Vehicles\HH109_Stadtgelenkbus1999_VHH\HHStadtgelenkbus99_main_Krueger+.bus - it is invalid! 425 20:07:14 - - Error: You want to create vehicle Vehicles\Citaro_K\Citaro_K.bus - it is invalid! 427 20:07:14 - - Error: You want to create vehicle Vehicles\Citaro_K\Citaro_K.bus - it is invalid! 429 20:07:14 - - Error: You want to create vehicle Vehicles\HH109_Stadtgelenkbus1999_VHH\HHStadtgelenkbus99_main_Krueger+.bus - it is invalid! 431 20:07:15 - - Error: You want to create vehicle Vehicles\Citaro_K\Citaro_K.bus - it is invalid! 433 20:07:15 - - Error: You want to create vehicle Vehicles\Citaro_K\Citaro_K.bus - it is invalid! 435 20:07:15 - - Error: You want to create vehicle Vehicles\HH109_Stadtgelenkbus1999_VHH\HHStadtgelenkbus99_main_Krueger+.bus - it is invalid! 437 20:07:15 - - Error: You want to create vehicle Vehicles\Citaro_K\Citaro_K.bus - it is invalid! 439 20:07:15 - - Error: You want to create vehicle Vehicles\Citaro_K\Citaro_K.bus - it is invalid! 441 20:07:15 - - Error: You want to create vehicle Vehicles\HH109_Stadtgelenkbus1999_VHH\HHStadtgelenkbus99_main_Krueger+.bus - it is invalid! 443 20:07:16 - - Error: You want to create vehicle Vehicles\Citaro_K\Citaro_K.bus - it is invalid! 445 20:07:16 - - Error: You want to create vehicle Vehicles\Citaro_K\Citaro_K.bus - it is invalid! 447 20:07:16 - - Error: You want to create vehicle Vehicles\HH109_Stadtgelenkbus1999_VHH\HHStadtgelenkbus99_main_Krueger+.bus - it is invalid! 449 20:07:16 - - Error: You want to create vehicle Vehicles\Citaro_K\Citaro_K.bus - it is invalid! 451 20:07:16 - - Error: You want to create vehicle Vehicles\Citaro_K\Citaro_K.bus - it is invalid! 453 20:07:16 - - Error: You want to create vehicle Vehicles\HH109_Stadtgelenkbus1999_VHH\HHStadtgelenkbus99_main_Krueger+.bus - it is invalid! 455 20:07:17 - - Error: You want to create vehicle Vehicles\Citaro_K\Citaro_K.bus - it is invalid! 457 20:07:17 - - Error: You want to create vehicle Vehicles\Citaro_K\Citaro_K.bus - it is invalid! 459 20:07:17 - - Error: You want to create vehicle Vehicles\HH109_Stadtgelenkbus1999_VHH\HHStadtgelenkbus99_main_Krueger+.bus - it is invalid! 461 20:07:17 - - Error: You want to create vehicle Vehicles\Citaro_K\Citaro_K.bus - it is invalid! 463 20:07:17 - - Error: You want to create vehicle Vehicles\Citaro_K\Citaro_K.bus - it is invalid! 465 20:07:17 - - Error: You want to create vehicle Vehicles\HH109_Stadtgelenkbus1999_VHH\HHStadtgelenkbus99_main_Krueger+.bus - it is invalid! 467 20:07:18 - - Error: You want to create vehicle Vehicles\Citaro_K\Citaro_K.bus - it is invalid! 469 20:07:18 - - Error: You want to create vehicle Vehicles\Citaro_K\Citaro_K.bus - it is invalid! 471 20:07:18 - - Error: You want to create vehicle Vehicles\HH109_Stadtgelenkbus1999_VHH\HHStadtgelenkbus99_main_Krueger+.bus - it is invalid! 473 20:07:18 - - Error: You want to create vehicle Vehicles\Citaro_K\Citaro_K.bus - it is invalid! 475 20:07:18 - - Error: You want to create vehicle Vehicles\Citaro_K\Citaro_K.bus - it is invalid! 477 20:07:18 - - Error: You want to create vehicle Vehicles\HH109_Stadtgelenkbus1999_VHH\HHStadtgelenkbus99_main_Krueger+.bus - it is invalid! 479 20:07:19 - - Error: You want to create vehicle Vehicles\Citaro_K\Citaro_K.bus - it is invalid! 481 20:07:19 - - Error: You want to create vehicle Vehicles\Citaro_K\Citaro_K.bus - it is invalid! 483 20:07:19 - - Error: You want to create vehicle Vehicles\HH109_Stadtgelenkbus1999_VHH\HHStadtgelenkbus99_main_Krueger+.bus - it is invalid! 485 20:07:19 - - Error: You want to create vehicle Vehicles\Citaro_K\Citaro_K.bus - it is invalid! 487 20:07:19 - - Error: You want to create vehicle Vehicles\Citaro_K\Citaro_K.bus - it is invalid! 489 20:07:19 - - Error: You want to create vehicle Vehicles\HH109_Stadtgelenkbus1999_VHH\HHStadtgelenkbus99_main_Krueger+.bus - it is invalid! 491 20:07:20 - - Error: You want to create vehicle Vehicles\Citaro_K\Citaro_K.bus - it is invalid! 493 20:07:20 - - Error: You want to create vehicle Vehicles\Citaro_K\Citaro_K.bus - it is invalid! 495 20:07:20 - - Error: You want to create vehicle Vehicles\HH109_Stadtgelenkbus1999_VHH\HHStadtgelenkbus99_main_Krueger+.bus - it is invalid! 497 20:07:20 - - Error: You want to create vehicle Vehicles\Citaro_K\Citaro_K.bus - it is invalid! 499 20:07:20 - - Error: You want to create vehicle Vehicles\Citaro_K\Citaro_K.bus - it is invalid! 501 20:07:20 - - Error: You want to create vehicle Vehicles\HH109_Stadtgelenkbus1999_VHH\HHStadtgelenkbus99_main_Krueger+.bus - it is invalid! 503 20:07:21 - - Error: You want to create vehicle Vehicles\Citaro_K\Citaro_K.bus - it is invalid! 505 20:07:21 - - Error: You want to create vehicle Vehicles\Citaro_K\Citaro_K.bus - it is invalid! 507 20:07:21 - - Error: You want to create vehicle Vehicles\HH109_Stadtgelenkbus1999_VHH\HHStadtgelenkbus99_main_Krueger+.bus - it is invalid! 509 20:07:21 - - Error: You want to create vehicle Vehicles\Citaro_K\Citaro_K.bus - it is invalid! 511 20:07:21 - - Error: You want to create vehicle Vehicles\Citaro_K\Citaro_K.bus - it is invalid! 513 20:07:21 - - Error: You want to create vehicle Vehicles\HH109_Stadtgelenkbus1999_VHH\HHStadtgelenkbus99_main_Krueger+.bus - it is invalid! 515 20:07:22 - - Error: You want to create vehicle Vehicles\Citaro_K\Citaro_K.bus - it is invalid! 517 20:07:22 - - Error: You want to create vehicle Vehicles\Citaro_K\Citaro_K.bus - it is invalid! 519 20:07:22 - - Error: You want to create vehicle Vehicles\HH109_Stadtgelenkbus1999_VHH\HHStadtgelenkbus99_main_Krueger+.bus - it is invalid! 521 20:07:22 - - Error: You want to create vehicle Vehicles\Citaro_K\Citaro_K.bus - it is invalid! 523 20:07:22 - - Error: You want to create vehicle Vehicles\Citaro_K\Citaro_K.bus - it is invalid! 525 20:07:22 - - Error: You want to create vehicle Vehicles\HH109_Stadtgelenkbus1999_VHH\HHStadtgelenkbus99_main_Krueger+.bus - it is invalid! 527 20:07:23 - - Error: You want to create vehicle Vehicles\Citaro_K\Citaro_K.bus - it is invalid! 529 20:07:23 - - Error: You want to create vehicle Vehicles\Citaro_K\Citaro_K.bus - it is invalid! 531 20:07:23 - - Error: You want to create vehicle Vehicles\HH109_Stadtgelenkbus1999_VHH\HHStadtgelenkbus99_main_Krueger+.bus - it is invalid! 533 20:07:23 - - Error: You want to create vehicle Vehicles\Citaro_K\Citaro_K.bus - it is invalid! 535 20:07:23 - - Error: You want to create vehicle Vehicles\Citaro_K\Citaro_K.bus - it is invalid! 537 20:07:23 - - Error: You want to create vehicle Vehicles\HH109_Stadtgelenkbus1999_VHH\HHStadtgelenkbus99_main_Krueger+.bus - it is invalid! 539 20:07:24 - - Error: You want to create vehicle Vehicles\Citaro_K\Citaro_K.bus - it is invalid! 541 20:07:24 - - Error: You want to create vehicle Vehicles\Citaro_K\Citaro_K.bus - it is invalid! 543 20:07:24 - - Error: You want to create vehicle Vehicles\HH109_Stadtgelenkbus1999_VHH\HHStadtgelenkbus99_main_Krueger+.bus - it is invalid! 545 20:07:24 - - Error: You want to create vehicle Vehicles\Citaro_K\Citaro_K.bus - it is invalid! 547 20:07:24 - - Error: You want to create vehicle Vehicles\Citaro_K\Citaro_K.bus - it is invalid! 549 20:07:24 - - Error: You want to create vehicle Vehicles\HH109_Stadtgelenkbus1999_VHH\HHStadtgelenkbus99_main_Krueger+.bus - it is invalid! 551 20:07:25 - - Error: You want to create vehicle Vehicles\Citaro_K\Citaro_K.bus - it is invalid! 553 20:07:25 - - Error: You want to create vehicle Vehicles\Citaro_K\Citaro_K.bus - it is invalid! 555 20:07:25 - - Error: You want to create vehicle Vehicles\HH109_Stadtgelenkbus1999_VHH\HHStadtgelenkbus99_main_Krueger+.bus - it is invalid! 557 20:07:25 - - Error: You want to create vehicle Vehicles\Citaro_K\Citaro_K.bus - it is invalid! 559 20:07:25 - - Error: You want to create vehicle Vehicles\Citaro_K\Citaro_K.bus - it is invalid! 561 20:07:25 - - Error: You want to create vehicle Vehicles\HH109_Stadtgelenkbus1999_VHH\HHStadtgelenkbus99_main_Krueger+.bus - it is invalid! 563 20:07:26 - - Error: You want to create vehicle Vehicles\Citaro_K\Citaro_K.bus - it is invalid! 565 20:07:26 - - Error: You want to create vehicle Vehicles\Citaro_K\Citaro_K.bus - it is invalid! 567 20:07:26 - - Error: You want to create vehicle Vehicles\HH109_Stadtgelenkbus1999_VHH\HHStadtgelenkbus99_main_Krueger+.bus - it is invalid! 569 20:07:26 - - Error: You want to create vehicle Vehicles\Citaro_K\Citaro_K.bus - it is invalid! 571 20:07:26 - - Error: You want to create vehicle Vehicles\Citaro_K\Citaro_K.bus - it is invalid! 573 20:07:26 - - Error: You want to create vehicle Vehicles\HH109_Stadtgelenkbus1999_VHH\HHStadtgelenkbus99_main_Krueger+.bus - it is invalid! 575 20:07:27 - - Error: You want to create vehicle Vehicles\Citaro_K\Citaro_K.bus - it is invalid! 577 20:07:27 - - Error: You want to create vehicle Vehicles\Citaro_K\Citaro_K.bus - it is invalid! 579 20:07:27 - - Error: You want to create vehicle Vehicles\HH109_Stadtgelenkbus1999_VHH\HHStadtgelenkbus99_main_Krueger+.bus - it is invalid! 581 20:07:27 - - Error: You want to create vehicle Vehicles\Citaro_K\Citaro_K.bus - it is invalid! 583 20:07:27 - - Error: You want to create vehicle Vehicles\Citaro_K\Citaro_K.bus - it is invalid! 585 20:07:27 - - Error: You want to create vehicle Vehicles\HH109_Stadtgelenkbus1999_VHH\HHStadtgelenkbus99_main_Krueger+.bus - it is invalid! 587 20:07:28 - - Error: You want to create vehicle Vehicles\Citaro_K\Citaro_K.bus - it is invalid! 589 20:07:28 - - Error: You want to create vehicle Vehicles\Citaro_K\Citaro_K.bus - it is invalid! 591 20:07:28 - - Error: You want to create vehicle Vehicles\HH109_Stadtgelenkbus1999_VHH\HHStadtgelenkbus99_main_Krueger+.bus - it is invalid! 593 20:07:28 - - Error: You want to create vehicle Vehicles\Citaro_K\Citaro_K.bus - it is invalid! 595 20:07:28 - - Error: You want to create vehicle Vehicles\Citaro_K\Citaro_K.bus - it is invalid! 597 20:07:28 - - Error: You want to create vehicle Vehicles\HH109_Stadtgelenkbus1999_VHH\HHStadtgelenkbus99_main_Krueger+.bus - it is invalid! 599 20:07:29 - - Error: You want to create vehicle Vehicles\Citaro_K\Citaro_K.bus - it is invalid! 601 20:07:29 - - Error: You want to create vehicle Vehicles\Citaro_K\Citaro_K.bus - it is invalid! 603 20:07:29 - - Error: You want to create vehicle Vehicles\HH109_Stadtgelenkbus1999_VHH\HHStadtgelenkbus99_main_Krueger+.bus - it is invalid! 605 20:07:29 - - Error: You want to create vehicle Vehicles\Citaro_K\Citaro_K.bus - it is invalid! 607 20:07:29 - - Error: You want to create vehicle Vehicles\Citaro_K\Citaro_K.bus - it is invalid! 609 20:07:29 - - Error: You want to create vehicle Vehicles\HH109_Stadtgelenkbus1999_VHH\HHStadtgelenkbus99_main_Krueger+.bus - it is invalid! 611 20:07:30 - - Error: You want to create vehicle Vehicles\Citaro_K\Citaro_K.bus - it is invalid! 613 20:07:30 - - Error: You want to create vehicle Vehicles\Citaro_K\Citaro_K.bus - it is invalid! 615 20:07:30 - - Error: You want to create vehicle Vehicles\HH109_Stadtgelenkbus1999_VHH\HHStadtgelenkbus99_main_Krueger+.bus - it is invalid! 617 20:07:30 - - Error: You want to create vehicle Vehicles\Citaro_K\Citaro_K.bus - it is invalid! 619 20:07:30 - - Error: You want to create vehicle Vehicles\Citaro_K\Citaro_K.bus - it is invalid! 621 20:07:30 - - Error: You want to create vehicle Vehicles\HH109_Stadtgelenkbus1999_VHH\HHStadtgelenkbus99_main_Krueger+.bus - it is invalid! 623 20:07:31 - - Error: You want to create vehicle Vehicles\Citaro_K\Citaro_K.bus - it is invalid! 625 20:07:31 - - Error: You want to create vehicle Vehicles\Citaro_K\Citaro_K.bus - it is invalid! 627 20:07:31 - - Error: You want to create vehicle Vehicles\HH109_Stadtgelenkbus1999_VHH\HHStadtgelenkbus99_main_Krueger+.bus - it is invalid! 629 20:07:31 - - Error: You want to create vehicle Vehicles\Citaro_K\Citaro_K.bus - it is invalid! 631 20:07:31 - - Error: You want to create vehicle Vehicles\Citaro_K\Citaro_K.bus - it is invalid! 633 20:07:31 - - Error: You want to create vehicle Vehicles\HH109_Stadtgelenkbus1999_VHH\HHStadtgelenkbus99_main_Krueger+.bus - it is invalid! 635 20:07:32 - - Error: You want to create vehicle Vehicles\Citaro_K\Citaro_K.bus - it is invalid! 637 20:07:32 - - Error: You want to create vehicle Vehicles\Citaro_K\Citaro_K.bus - it is invalid! 639 20:07:32 - - Error: You want to create vehicle Vehicles\HH109_Stadtgelenkbus1999_VHH\HHStadtgelenkbus99_main_Krueger+.bus - it is invalid! 641 20:07:32 - - Error: You want to create vehicle Vehicles\Citaro_K\Citaro_K.bus - it is invalid! 643 20:07:32 - - Error: You want to create vehicle Vehicles\Citaro_K\Citaro_K.bus - it is invalid! 645 20:07:32 - - Error: You want to create vehicle Vehicles\HH109_Stadtgelenkbus1999_VHH\HHStadtgelenkbus99_main_Krueger+.bus - it is invalid! 647 20:07:33 - - Error: You want to create vehicle Vehicles\Citaro_K\Citaro_K.bus - it is invalid! 649 20:07:33 - - Error: You want to create vehicle Vehicles\Citaro_K\Citaro_K.bus - it is invalid! 651 20:07:33 - - Error: You want to create vehicle Vehicles\HH109_Stadtgelenkbus1999_VHH\HHStadtgelenkbus99_main_Krueger+.bus - it is invalid! 653 20:07:33 - - Error: You want to create vehicle Vehicles\Citaro_K\Citaro_K.bus - it is invalid! 655 20:07:33 - - Error: You want to create vehicle Vehicles\Citaro_K\Citaro_K.bus - it is invalid! 657 20:07:33 - - Error: You want to create vehicle Vehicles\HH109_Stadtgelenkbus1999_VHH\HHStadtgelenkbus99_main_Krueger+.bus - it is invalid! 659 20:07:34 - - Error: You want to create vehicle Vehicles\Citaro_K\Citaro_K.bus - it is invalid! 661 20:07:34 - - Error: You want to create vehicle Vehicles\Citaro_K\Citaro_K.bus - it is invalid! 663 20:07:34 - - Error: You want to create vehicle Vehicles\HH109_Stadtgelenkbus1999_VHH\HHStadtgelenkbus99_main_Krueger+.bus - it is invalid! 665 20:07:34 - - Error: You want to create vehicle Vehicles\Citaro_K\Citaro_K.bus - it is invalid! 667 20:07:34 - - Error: You want to create vehicle Vehicles\Citaro_K\Citaro_K.bus - it is invalid! 669 20:07:34 - - Error: You want to create vehicle Vehicles\HH109_Stadtgelenkbus1999_VHH\HHStadtgelenkbus99_main_Krueger+.bus - it is invalid! 671 20:07:35 - - Error: You want to create vehicle Vehicles\Citaro_K\Citaro_K.bus - it is invalid! 673 20:07:35 - - Error: You want to create vehicle Vehicles\Citaro_K\Citaro_K.bus - it is invalid! 675 20:07:35 - - Error: You want to create vehicle Vehicles\HH109_Stadtgelenkbus1999_VHH\HHStadtgelenkbus99_main_Krueger+.bus - it is invalid! 677 20:07:35 - - Error: You want to create vehicle Vehicles\Citaro_K\Citaro_K.bus - it is invalid! 679 20:07:35 - - Error: You want to create vehicle Vehicles\Citaro_K\Citaro_K.bus - it is invalid! 681 20:07:35 - - Error: You want to create vehicle Vehicles\HH109_Stadtgelenkbus1999_VHH\HHStadtgelenkbus99_main_Krueger+.bus - it is invalid! 683 20:07:36 - - Error: You want to create vehicle Vehicles\Citaro_K\Citaro_K.bus - it is invalid! 685 20:07:36 - - Error: You want to create vehicle Vehicles\Citaro_K\Citaro_K.bus - it is invalid! 687 20:07:36 - - Error: You want to create vehicle Vehicles\HH109_Stadtgelenkbus1999_VHH\HHStadtgelenkbus99_main_Krueger+.bus - it is invalid! 689 20:07:37 - - Error: You want to create vehicle Vehicles\Citaro_K\Citaro_K.bus - it is invalid! 691 20:07:37 - - Error: You want to create vehicle Vehicles\Citaro_K\Citaro_K.bus - it is invalid! 693 20:07:37 - - Error: You want to create vehicle Vehicles\HH109_Stadtgelenkbus1999_VHH\HHStadtgelenkbus99_main_Krueger+.bus - it is invalid! 695 20:07:37 - - Error: You want to create vehicle Vehicles\Citaro_K\Citaro_K.bus - it is invalid! 697 20:07:37 - - Error: You want to create vehicle Vehicles\Citaro_K\Citaro_K.bus - it is invalid! 699 20:07:37 - - Error: You want to create vehicle Vehicles\HH109_Stadtgelenkbus1999_VHH\HHStadtgelenkbus99_main_Krueger+.bus - it is invalid! 701 20:07:38 - - Error: You want to create vehicle Vehicles\Citaro_K\Citaro_K.bus - it is invalid! 703 20:07:38 - - Error: You want to create vehicle Vehicles\Citaro_K\Citaro_K.bus - it is invalid! 705 20:07:38 - - Error: You want to create vehicle Vehicles\HH109_Stadtgelenkbus1999_VHH\HHStadtgelenkbus99_main_Krueger+.bus - it is invalid! 707 20:07:38 - - Error: You want to create vehicle Vehicles\Citaro_K\Citaro_K.bus - it is invalid! 709 20:07:38 - - Error: You want to create vehicle Vehicles\Citaro_K\Citaro_K.bus - it is invalid! 711 20:07:38 - - Error: You want to create vehicle Vehicles\HH109_Stadtgelenkbus1999_VHH\HHStadtgelenkbus99_main_Krueger+.bus - it is invalid! 713 20:07:39 - - Error: You want to create vehicle Vehicles\Citaro_K\Citaro_K.bus - it is invalid! 715 20:07:39 - - Error: You want to create vehicle Vehicles\Citaro_K\Citaro_K.bus - it is invalid! 717 20:07:39 - - Error: You want to create vehicle Vehicles\HH109_Stadtgelenkbus1999_VHH\HHStadtgelenkbus99_main_Krueger+.bus - it is invalid! 719 20:07:39 - - Error: You want to create vehicle Vehicles\Citaro_K\Citaro_K.bus - it is invalid! 721 20:07:39 - - Error: You want to create vehicle Vehicles\Citaro_K\Citaro_K.bus - it is invalid! 723 20:07:39 - - Error: You want to create vehicle Vehicles\HH109_Stadtgelenkbus1999_VHH\HHStadtgelenkbus99_main_Krueger+.bus - it is invalid! 725 20:07:40 - - Error: You want to create vehicle Vehicles\Citaro_K\Citaro_K.bus - it is invalid! 727 20:07:40 - - Error: You want to create vehicle Vehicles\Citaro_K\Citaro_K.bus - it is invalid! 729 20:07:40 - - Error: You want to create vehicle Vehicles\HH109_Stadtgelenkbus1999_VHH\HHStadtgelenkbus99_main_Krueger+.bus - it is invalid! 731 20:07:40 - - Error: You want to create vehicle Vehicles\Citaro_K\Citaro_K.bus - it is invalid! 733 20:07:40 - - Error: You want to create vehicle Vehicles\Citaro_K\Citaro_K.bus - it is invalid! 735 20:07:40 - - Error: You want to create vehicle Vehicles\HH109_Stadtgelenkbus1999_VHH\HHStadtgelenkbus99_main_Krueger+.bus - it is invalid! 737 20:07:41 - - Error: You want to create vehicle Vehicles\Citaro_K\Citaro_K.bus - it is invalid! 739 20:07:41 - - Error: You want to create vehicle Vehicles\Citaro_K\Citaro_K.bus - it is invalid! 741 20:07:41 - - Error: You want to create vehicle Vehicles\HH109_Stadtgelenkbus1999_VHH\HHStadtgelenkbus99_main_Krueger+.bus - it is invalid! 743 20:07:41 - - Error: You want to create vehicle Vehicles\Citaro_K\Citaro_K.bus - it is invalid! 745 20:07:41 - - Error: You want to create vehicle Vehicles\Citaro_K\Citaro_K.bus - it is invalid! 747 20:07:41 - - Error: You want to create vehicle Vehicles\HH109_Stadtgelenkbus1999_VHH\HHStadtgelenkbus99_main_Krueger+.bus - it is invalid! 749 20:07:42 - - Error: You want to create vehicle Vehicles\Citaro_K\Citaro_K.bus - it is invalid! 751 20:07:42 - - Error: You want to create vehicle Vehicles\Citaro_K\Citaro_K.bus - it is invalid! 753 20:07:42 - - Error: You want to create vehicle Vehicles\HH109_Stadtgelenkbus1999_VHH\HHStadtgelenkbus99_main_Krueger+.bus - it is invalid! 755 20:07:42 - - Error: You want to create vehicle Vehicles\Citaro_K\Citaro_K.bus - it is invalid! 757 20:07:42 - - Error: You want to create vehicle Vehicles\Citaro_K\Citaro_K.bus - it is invalid! 759 20:07:42 - - Error: You want to create vehicle Vehicles\HH109_Stadtgelenkbus1999_VHH\HHStadtgelenkbus99_main_Krueger+.bus - it is invalid! 761 20:07:43 - - Error: You want to create vehicle Vehicles\Citaro_K\Citaro_K.bus - it is invalid! 763 20:07:43 - - Error: You want to create vehicle Vehicles\Citaro_K\Citaro_K.bus - it is invalid! 765 20:07:43 - - Error: You want to create vehicle Vehicles\HH109_Stadtgelenkbus1999_VHH\HHStadtgelenkbus99_main_Krueger+.bus - it is invalid! 767 20:07:43 - - Error: You want to create vehicle Vehicles\Citaro_K\Citaro_K.bus - it is invalid! 769 20:07:43 - - Error: You want to create vehicle Vehicles\Citaro_K\Citaro_K.bus - it is invalid! 771 20:07:43 - - Error: You want to create vehicle Vehicles\HH109_Stadtgelenkbus1999_VHH\HHStadtgelenkbus99_main_Krueger+.bus - it is invalid! 773 20:07:44 - - Error: You want to create vehicle Vehicles\Citaro_K\Citaro_K.bus - it is invalid! 775 20:07:44 - - Error: You want to create vehicle Vehicles\Citaro_K\Citaro_K.bus - it is invalid! 777 20:07:44 - - Error: You want to create vehicle Vehicles\HH109_Stadtgelenkbus1999_VHH\HHStadtgelenkbus99_main_Krueger+.bus - it is invalid! 778 20:07:44 - - Warning: Did not find texture file "Tree_Small_09.tga"! 780 20:07:44 - - Error: You want to create vehicle Vehicles\Citaro_K\Citaro_K.bus - it is invalid! 782 20:07:44 - - Error: You want to create vehicle Vehicles\Citaro_K\Citaro_K.bus - it is invalid! 784 20:07:44 - - Error: You want to create vehicle Vehicles\HH109_Stadtgelenkbus1999_VHH\HHStadtgelenkbus99_main_Krueger+.bus - it is invalid! 786 20:07:45 - - Error: You want to create vehicle Vehicles\Citaro_K\Citaro_K.bus - it is invalid! 788 20:07:45 - - Error: You want to create vehicle Vehicles\Citaro_K\Citaro_K.bus - it is invalid! 790 20:07:45 - - Error: You want to create vehicle Vehicles\HH109_Stadtgelenkbus1999_VHH\HHStadtgelenkbus99_main_Krueger+.bus - it is invalid! 792 20:07:45 - - Error: You want to create vehicle Vehicles\Citaro_K\Citaro_K.bus - it is invalid! 794 20:07:45 - - Error: You want to create vehicle Vehicles\Citaro_K\Citaro_K.bus - it is invalid! 796 20:07:45 - - Error: You want to create vehicle Vehicles\HH109_Stadtgelenkbus1999_VHH\HHStadtgelenkbus99_main_Krueger+.bus - it is invalid! 798 20:07:46 - - Error: You want to create vehicle Vehicles\Citaro_K\Citaro_K.bus - it is invalid! 800 20:07:46 - - Error: You want to create vehicle Vehicles\Citaro_K\Citaro_K.bus - it is invalid! 802 20:07:46 - - Error: You want to create vehicle Vehicles\HH109_Stadtgelenkbus1999_VHH\HHStadtgelenkbus99_main_Krueger+.bus - it is invalid! 804 20:07:46 - - Error: You want to create vehicle Vehicles\Citaro_K\Citaro_K.bus - it is invalid! 806 20:07:46 - - Error: You want to create vehicle Vehicles\Citaro_K\Citaro_K.bus - it is invalid! 808 20:07:46 - - Error: You want to create vehicle Vehicles\HH109_Stadtgelenkbus1999_VHH\HHStadtgelenkbus99_main_Krueger+.bus - it is invalid! 810 20:07:47 - - Error: You want to create vehicle Vehicles\Citaro_K\Citaro_K.bus - it is invalid! 812 20:07:47 - - Error: You want to create vehicle Vehicles\Citaro_K\Citaro_K.bus - it is invalid! 814 20:07:47 - - Error: You want to create vehicle Vehicles\HH109_Stadtgelenkbus1999_VHH\HHStadtgelenkbus99_main_Krueger+.bus - it is invalid! 816 20:07:47 - - Error: You want to create vehicle Vehicles\Citaro_K\Citaro_K.bus - it is invalid! 818 20:07:47 - - Error: You want to create vehicle Vehicles\Citaro_K\Citaro_K.bus - it is invalid! 820 20:07:47 - - Error: You want to create vehicle Vehicles\HH109_Stadtgelenkbus1999_VHH\HHStadtgelenkbus99_main_Krueger+.bus - it is invalid! 822 20:07:48 - - Error: You want to create vehicle Vehicles\Citaro_K\Citaro_K.bus - it is invalid! 824 20:07:48 - - Error: You want to create vehicle Vehicles\Citaro_K\Citaro_K.bus - it is invalid! 826 20:07:48 - - Error: You want to create vehicle Vehicles\HH109_Stadtgelenkbus1999_VHH\HHStadtgelenkbus99_main_Krueger+.bus - it is invalid! 828 20:07:48 - - Error: You want to create vehicle Vehicles\Citaro_K\Citaro_K.bus - it is invalid! 830 20:07:48 - - Error: You want to create vehicle Vehicles\Citaro_K\Citaro_K.bus - it is invalid! 832 20:07:48 - - Error: You want to create vehicle Vehicles\HH109_Stadtgelenkbus1999_VHH\HHStadtgelenkbus99_main_Krueger+.bus - it is invalid! 834 20:07:49 - - Error: You want to create vehicle Vehicles\Citaro_K\Citaro_K.bus - it is invalid! 836 20:07:49 - - Error: You want to create vehicle Vehicles\Citaro_K\Citaro_K.bus - it is invalid! 838 20:07:49 - - Error: You want to create vehicle Vehicles\HH109_Stadtgelenkbus1999_VHH\HHStadtgelenkbus99_main_Krueger+.bus - it is invalid! 840 20:07:49 - - Error: You want to create vehicle Vehicles\Citaro_K\Citaro_K.bus - it is invalid! 842 20:07:49 - - Error: You want to create vehicle Vehicles\Citaro_K\Citaro_K.bus - it is invalid! 844 20:07:49 - - Error: You want to create vehicle Vehicles\HH109_Stadtgelenkbus1999_VHH\HHStadtgelenkbus99_main_Krueger+.bus - it is invalid! 846 20:07:50 - - Error: You want to create vehicle Vehicles\Citaro_K\Citaro_K.bus - it is invalid! 848 20:07:50 - - Error: You want to create vehicle Vehicles\Citaro_K\Citaro_K.bus - it is invalid! 850 20:07:50 - - Error: You want to create vehicle Vehicles\HH109_Stadtgelenkbus1999_VHH\HHStadtgelenkbus99_main_Krueger+.bus - it is invalid! 852 20:07:50 - - Error: You want to create vehicle Vehicles\Citaro_K\Citaro_K.bus - it is invalid! 854 20:07:50 - - Error: You want to create vehicle Vehicles\Citaro_K\Citaro_K.bus - it is invalid! 856 20:07:50 - - Error: You want to create vehicle Vehicles\HH109_Stadtgelenkbus1999_VHH\HHStadtgelenkbus99_main_Krueger+.bus - it is invalid! 858 20:07:51 - - Error: You want to create vehicle Vehicles\Citaro_K\Citaro_K.bus - it is invalid! 860 20:07:51 - - Error: You want to create vehicle Vehicles\Citaro_K\Citaro_K.bus - it is invalid! 862 20:07:51 - - Error: You want to create vehicle Vehicles\HH109_Stadtgelenkbus1999_VHH\HHStadtgelenkbus99_main_Krueger+.bus - it is invalid! 864 20:07:51 - - Error: You want to create vehicle Vehicles\Citaro_K\Citaro_K.bus - it is invalid! 866 20:07:51 - - Error: You want to create vehicle Vehicles\Citaro_K\Citaro_K.bus - it is invalid! 868 20:07:51 - - Error: You want to create vehicle Vehicles\HH109_Stadtgelenkbus1999_VHH\HHStadtgelenkbus99_main_Krueger+.bus - it is invalid! 870 20:07:52 - - Error: You want to create vehicle Vehicles\Citaro_K\Citaro_K.bus - it is invalid! 872 20:07:52 - - Error: You want to create vehicle Vehicles\Citaro_K\Citaro_K.bus - it is invalid! 874 20:07:52 - - Error: You want to create vehicle Vehicles\HH109_Stadtgelenkbus1999_VHH\HHStadtgelenkbus99_main_Krueger+.bus - it is invalid! 876 20:07:52 - - Error: You want to create vehicle Vehicles\Citaro_K\Citaro_K.bus - it is invalid! 878 20:07:52 - - Error: You want to create vehicle Vehicles\Citaro_K\Citaro_K.bus - it is invalid! 880 20:07:52 - - Error: You want to create vehicle Vehicles\HH109_Stadtgelenkbus1999_VHH\HHStadtgelenkbus99_main_Krueger+.bus - it is invalid! 882 20:07:53 - - Error: You want to create vehicle Vehicles\Citaro_K\Citaro_K.bus - it is invalid! 884 20:07:53 - - Error: You want to create vehicle Vehicles\Citaro_K\Citaro_K.bus - it is invalid! 886 20:07:53 - - Error: You want to create vehicle Vehicles\HH109_Stadtgelenkbus1999_VHH\HHStadtgelenkbus99_main_Krueger+.bus - it is invalid! 888 20:07:53 - - Error: You want to create vehicle Vehicles\Citaro_K\Citaro_K.bus - it is invalid! 890 20:07:53 - - Error: You want to create vehicle Vehicles\Citaro_K\Citaro_K.bus - it is invalid! 892 20:07:53 - - Error: You want to create vehicle Vehicles\HH109_Stadtgelenkbus1999_VHH\HHStadtgelenkbus99_main_Krueger+.bus - it is invalid! 894 20:07:54 - - Error: You want to create vehicle Vehicles\Citaro_K\Citaro_K.bus - it is invalid! 896 20:07:54 - - Error: You want to create vehicle Vehicles\Citaro_K\Citaro_K.bus - it is invalid! 898 20:07:54 - - Error: You want to create vehicle Vehicles\HH109_Stadtgelenkbus1999_VHH\HHStadtgelenkbus99_main_Krueger+.bus - it is invalid! 900 20:07:54 - - Error: You want to create vehicle Vehicles\Citaro_K\Citaro_K.bus - it is invalid! 902 20:07:54 - - Error: You want to create vehicle Vehicles\Citaro_K\Citaro_K.bus - it is invalid! 904 20:07:54 - - Error: You want to create vehicle Vehicles\HH109_Stadtgelenkbus1999_VHH\HHStadtgelenkbus99_main_Krueger+.bus - it is invalid! 906 20:07:55 - - Error: You want to create vehicle Vehicles\Citaro_K\Citaro_K.bus - it is invalid! 908 20:07:55 - - Error: You want to create vehicle Vehicles\Citaro_K\Citaro_K.bus - it is invalid! 910 20:07:55 - - Error: You want to create vehicle Vehicles\HH109_Stadtgelenkbus1999_VHH\HHStadtgelenkbus99_main_Krueger+.bus - it is invalid! 912 20:07:55 - - Error: You want to create vehicle Vehicles\Citaro_K\Citaro_K.bus - it is invalid! 914 20:07:55 - - Error: You want to create vehicle Vehicles\Citaro_K\Citaro_K.bus - it is invalid! 916 20:07:55 - - Error: You want to create vehicle Vehicles\HH109_Stadtgelenkbus1999_VHH\HHStadtgelenkbus99_main_Krueger+.bus - it is invalid! 918 20:07:56 - - Error: You want to create vehicle Vehicles\Citaro_K\Citaro_K.bus - it is invalid! 920 20:07:56 - - Error: You want to create vehicle Vehicles\Citaro_K\Citaro_K.bus - it is invalid! 922 20:07:56 - - Error: You want to create vehicle Vehicles\HH109_Stadtgelenkbus1999_VHH\HHStadtgelenkbus99_main_Krueger+.bus - it is invalid! 924 20:07:56 - - Error: You want to create vehicle Vehicles\Citaro_K\Citaro_K.bus - it is invalid! 926 20:07:56 - - Error: You want to create vehicle Vehicles\Citaro_K\Citaro_K.bus - it is invalid! 928 20:07:56 - - Error: You want to create vehicle Vehicles\HH109_Stadtgelenkbus1999_VHH\HHStadtgelenkbus99_main_Krueger+.bus - it is invalid! 930 20:07:57 - - Error: You want to create vehicle Vehicles\Citaro_K\Citaro_K.bus - it is invalid! 932 20:07:57 - - Error: You want to create vehicle Vehicles\Citaro_K\Citaro_K.bus - it is invalid! 934 20:07:57 - - Error: You want to create vehicle Vehicles\HH109_Stadtgelenkbus1999_VHH\HHStadtgelenkbus99_main_Krueger+.bus - it is invalid! 936 20:07:57 - - Error: You want to create vehicle Vehicles\Citaro_K\Citaro_K.bus - it is invalid! 938 20:07:57 - - Error: You want to create vehicle Vehicles\Citaro_K\Citaro_K.bus - it is invalid! 940 20:07:57 - - Error: You want to create vehicle Vehicles\HH109_Stadtgelenkbus1999_VHH\HHStadtgelenkbus99_main_Krueger+.bus - it is invalid! 942 20:07:58 - - Error: You want to create vehicle Vehicles\Citaro_K\Citaro_K.bus - it is invalid! 944 20:07:58 - - Error: You want to create vehicle Vehicles\Citaro_K\Citaro_K.bus - it is invalid! 946 20:07:58 - - Error: You want to create vehicle Vehicles\HH109_Stadtgelenkbus1999_VHH\HHStadtgelenkbus99_main_Krueger+.bus - it is invalid! 948 20:07:58 - - Error: You want to create vehicle Vehicles\Citaro_K\Citaro_K.bus - it is invalid! 950 20:07:58 - - Error: You want to create vehicle Vehicles\Citaro_K\Citaro_K.bus - it is invalid! 952 20:07:58 - - Error: You want to create vehicle Vehicles\HH109_Stadtgelenkbus1999_VHH\HHStadtgelenkbus99_main_Krueger+.bus - it is invalid! 954 20:07:59 - - Error: You want to create vehicle Vehicles\Citaro_K\Citaro_K.bus - it is invalid! 956 20:07:59 - - Error: You want to create vehicle Vehicles\Citaro_K\Citaro_K.bus - it is invalid! 958 20:07:59 - - Error: You want to create vehicle Vehicles\HH109_Stadtgelenkbus1999_VHH\HHStadtgelenkbus99_main_Krueger+.bus - it is invalid! 960 20:07:59 - - Error: You want to create vehicle Vehicles\Citaro_K\Citaro_K.bus - it is invalid! 962 20:07:59 - - Error: You want to create vehicle Vehicles\Citaro_K\Citaro_K.bus - it is invalid! 964 20:07:59 - - Error: You want to create vehicle Vehicles\HH109_Stadtgelenkbus1999_VHH\HHStadtgelenkbus99_main_Krueger+.bus - it is invalid! 966 20:08:00 - - Error: You want to create vehicle Vehicles\Citaro_K\Citaro_K.bus - it is invalid! 968 20:08:00 - - Error: You want to create vehicle Vehicles\Citaro_K\Citaro_K.bus - it is invalid! 970 20:08:00 - - Error: You want to create vehicle Vehicles\HH109_Stadtgelenkbus1999_VHH\HHStadtgelenkbus99_main_Krueger+.bus - it is invalid! 972 20:08:00 - - Error: You want to create vehicle Vehicles\Citaro_K\Citaro_K.bus - it is invalid! 974 20:08:00 - - Error: You want to create vehicle Vehicles\Citaro_K\Citaro_K.bus - it is invalid! 976 20:08:00 - - Error: You want to create vehicle Vehicles\HH109_Stadtgelenkbus1999_VHH\HHStadtgelenkbus99_main_Krueger+.bus - it is invalid! 977 20:08:01 - - Warning: Did not find texture file "HH109_Kennz.bmp"! 979 20:08:01 - - Error: You want to create vehicle Vehicles\Citaro_K\Citaro_K.bus - it is invalid! 981 20:08:01 - - Error: You want to create vehicle Vehicles\Citaro_K\Citaro_K.bus - it is invalid! 983 20:08:01 - - Error: You want to create vehicle Vehicles\HH109_Stadtgelenkbus1999_VHH\HHStadtgelenkbus99_main_Krueger+.bus - it is invalid! 986 20:08:01 - - Error: You want to create vehicle Vehicles\Citaro_K\Citaro_K.bus - it is invalid! 988 20:08:01 - - Error: You want to create vehicle Vehicles\Citaro_K\Citaro_K.bus - it is invalid! 990 20:08:01 - - Error: You want to create vehicle Vehicles\HH109_Stadtgelenkbus1999_VHH\HHStadtgelenkbus99_main_Krueger+.bus - it is invalid! 992 20:08:02 - - Error: You want to create vehicle Vehicles\Citaro_K\Citaro_K.bus - it is invalid! 994 20:08:02 - - Error: You want to create vehicle Vehicles\Citaro_K\Citaro_K.bus - it is invalid! 996 20:08:02 - - Error: You want to create vehicle Vehicles\HH109_Stadtgelenkbus1999_VHH\HHStadtgelenkbus99_main_Krueger+.bus - it is invalid! 998 20:08:02 - - Error: You want to create vehicle Vehicles\Citaro_K\Citaro_K.bus - it is invalid! 1000 20:08:02 - - Error: You want to create vehicle Vehicles\Citaro_K\Citaro_K.bus - it is invalid! 1002 20:08:02 - - Error: You want to create vehicle Vehicles\HH109_Stadtgelenkbus1999_VHH\HHStadtgelenkbus99_main_Krueger+.bus - it is invalid! 1004 20:08:03 - - Error: You want to create vehicle Vehicles\Citaro_K\Citaro_K.bus - it is invalid! 1006 20:08:03 - - Error: You want to create vehicle Vehicles\Citaro_K\Citaro_K.bus - it is invalid! 1008 20:08:03 - - Error: You want to create vehicle Vehicles\HH109_Stadtgelenkbus1999_VHH\HHStadtgelenkbus99_main_Krueger+.bus - it is invalid! 1010 20:08:03 - - Error: You want to create vehicle Vehicles\Citaro_K\Citaro_K.bus - it is invalid! 1012 20:08:03 - - Error: You want to create vehicle Vehicles\Citaro_K\Citaro_K.bus - it is invalid! 1014 20:08:03 - - Error: You want to create vehicle Vehicles\HH109_Stadtgelenkbus1999_VHH\HHStadtgelenkbus99_main_Krueger+.bus - it is invalid! 1016 20:08:04 - - Error: You want to create vehicle Vehicles\Citaro_K\Citaro_K.bus - it is invalid! 1018 20:08:04 - - Error: You want to create vehicle Vehicles\Citaro_K\Citaro_K.bus - it is invalid! 1020 20:08:04 - - Error: You want to create vehicle Vehicles\HH109_Stadtgelenkbus1999_VHH\HHStadtgelenkbus99_main_Krueger+.bus - it is invalid! 1022 20:08:04 - - Error: You want to create vehicle Vehicles\Citaro_K\Citaro_K.bus - it is invalid! 1024 20:08:04 - - Error: You want to create vehicle Vehicles\Citaro_K\Citaro_K.bus - it is invalid! 1026 20:08:04 - - Error: You want to create vehicle Vehicles\HH109_Stadtgelenkbus1999_VHH\HHStadtgelenkbus99_main_Krueger+.bus - it is invalid! 1028 20:08:05 - - Error: You want to create vehicle Vehicles\Citaro_K\Citaro_K.bus - it is invalid! 1030 20:08:05 - - Error: You want to create vehicle Vehicles\Citaro_K\Citaro_K.bus - it is invalid! 1032 20:08:05 - - Error: You want to create vehicle Vehicles\HH109_Stadtgelenkbus1999_VHH\HHStadtgelenkbus99_main_Krueger+.bus - it is invalid! 1034 20:08:05 - - Error: You want to create vehicle Vehicles\Citaro_K\Citaro_K.bus - it is invalid! 1036 20:08:05 - - Error: You want to create vehicle Vehicles\Citaro_K\Citaro_K.bus - it is invalid! 1038 20:08:05 - - Error: You want to create vehicle Vehicles\HH109_Stadtgelenkbus1999_VHH\HHStadtgelenkbus99_main_Krueger+.bus - it is invalid! 1040 20:08:06 - - Error: You want to create vehicle Vehicles\Citaro_K\Citaro_K.bus - it is invalid! 1042 20:08:06 - - Error: You want to create vehicle Vehicles\Citaro_K\Citaro_K.bus - it is invalid! 1044 20:08:06 - - Error: You want to create vehicle Vehicles\HH109_Stadtgelenkbus1999_VHH\HHStadtgelenkbus99_main_Krueger+.bus - it is invalid! 1046 20:08:06 - - Error: You want to create vehicle Vehicles\Citaro_K\Citaro_K.bus - it is invalid! 1048 20:08:06 - - Error: You want to create vehicle Vehicles\Citaro_K\Citaro_K.bus - it is invalid! 1050 20:08:06 - - Error: You want to create vehicle Vehicles\HH109_Stadtgelenkbus1999_VHH\HHStadtgelenkbus99_main_Krueger+.bus - it is invalid! 1052 20:08:07 - - Error: You want to create vehicle Vehicles\Citaro_K\Citaro_K.bus - it is invalid! 1054 20:08:07 - - Error: You want to create vehicle Vehicles\Citaro_K\Citaro_K.bus - it is invalid! 1056 20:08:07 - - Error: You want to create vehicle Vehicles\HH109_Stadtgelenkbus1999_VHH\HHStadtgelenkbus99_main_Krueger+.bus - it is invalid! 1058 20:08:07 - - Error: You want to create vehicle Vehicles\Citaro_K\Citaro_K.bus - it is invalid! 1060 20:08:07 - - Error: You want to create vehicle Vehicles\Citaro_K\Citaro_K.bus - it is invalid! 1062 20:08:07 - - Error: You want to create vehicle Vehicles\HH109_Stadtgelenkbus1999_VHH\HHStadtgelenkbus99_main_Krueger+.bus - it is invalid! 1064 20:08:08 - - Error: You want to create vehicle Vehicles\Citaro_K\Citaro_K.bus - it is invalid! 1066 20:08:08 - - Error: You want to create vehicle Vehicles\Citaro_K\Citaro_K.bus - it is invalid! 1068 20:08:08 - - Error: You want to create vehicle Vehicles\HH109_Stadtgelenkbus1999_VHH\HHStadtgelenkbus99_main_Krueger+.bus - it is invalid! 1070 20:08:08 - - Error: You want to create vehicle Vehicles\Citaro_K\Citaro_K.bus - it is invalid! 1072 20:08:08 - - Error: You want to create vehicle Vehicles\Citaro_K\Citaro_K.bus - it is invalid! 1074 20:08:08 - - Error: You want to create vehicle Vehicles\HH109_Stadtgelenkbus1999_VHH\HHStadtgelenkbus99_main_Krueger+.bus - it is invalid! 1076 20:08:09 - - Error: You want to create vehicle Vehicles\Citaro_K\Citaro_K.bus - it is invalid! 1078 20:08:09 - - Error: You want to create vehicle Vehicles\Citaro_K\Citaro_K.bus - it is invalid! 1080 20:08:09 - - Error: You want to create vehicle Vehicles\HH109_Stadtgelenkbus1999_VHH\HHStadtgelenkbus99_main_Krueger+.bus - it is invalid! 1082 20:08:09 - - Error: You want to create vehicle Vehicles\Citaro_K\Citaro_K.bus - it is invalid! 1084 20:08:09 - - Error: You want to create vehicle Vehicles\Citaro_K\Citaro_K.bus - it is invalid! 1086 20:08:09 - - Error: You want to create vehicle Vehicles\HH109_Stadtgelenkbus1999_VHH\HHStadtgelenkbus99_main_Krueger+.bus - it is invalid! 1088 20:08:10 - - Error: You want to create vehicle Vehicles\Citaro_K\Citaro_K.bus - it is invalid! 1090 20:08:10 - - Error: You want to create vehicle Vehicles\Citaro_K\Citaro_K.bus - it is invalid! 1092 20:08:10 - - Error: You want to create vehicle Vehicles\HH109_Stadtgelenkbus1999_VHH\HHStadtgelenkbus99_main_Krueger+.bus - it is invalid! 1094 20:08:10 - - Error: You want to create vehicle Vehicles\Citaro_K\Citaro_K.bus - it is invalid! 1096 20:08:10 - - Error: You want to create vehicle Vehicles\Citaro_K\Citaro_K.bus - it is invalid! 1098 20:08:10 - - Error: You want to create vehicle Vehicles\HH109_Stadtgelenkbus1999_VHH\HHStadtgelenkbus99_main_Krueger+.bus - it is invalid! 1100 20:08:11 - - Error: You want to create vehicle Vehicles\Citaro_K\Citaro_K.bus - it is invalid! 1102 20:08:11 - - Error: You want to create vehicle Vehicles\Citaro_K\Citaro_K.bus - it is invalid! 1104 20:08:11 - - Error: You want to create vehicle Vehicles\HH109_Stadtgelenkbus1999_VHH\HHStadtgelenkbus99_main_Krueger+.bus - it is invalid! 1106 20:08:11 - - Error: You want to create vehicle Vehicles\Citaro_K\Citaro_K.bus - it is invalid! 1108 20:08:11 - - Error: You want to create vehicle Vehicles\Citaro_K\Citaro_K.bus - it is invalid! 1110 20:08:11 - - Error: You want to create vehicle Vehicles\HH109_Stadtgelenkbus1999_VHH\HHStadtgelenkbus99_main_Krueger+.bus - it is invalid! 1112 20:08:12 - - Error: You want to create vehicle Vehicles\Citaro_K\Citaro_K.bus - it is invalid! 1114 20:08:12 - - Error: You want to create vehicle Vehicles\Citaro_K\Citaro_K.bus - it is invalid! 1116 20:08:12 - - Error: You want to create vehicle Vehicles\HH109_Stadtgelenkbus1999_VHH\HHStadtgelenkbus99_main_Krueger+.bus - it is invalid! 1118 20:08:12 - - Error: You want to create vehicle Vehicles\Citaro_K\Citaro_K.bus - it is invalid! 1120 20:08:12 - - Error: You want to create vehicle Vehicles\Citaro_K\Citaro_K.bus - it is invalid! 1122 20:08:12 - - Error: You want to create vehicle Vehicles\HH109_Stadtgelenkbus1999_VHH\HHStadtgelenkbus99_main_Krueger+.bus - it is invalid! 1124 20:08:13 - - Error: You want to create vehicle Vehicles\Citaro_K\Citaro_K.bus - it is invalid! 1126 20:08:13 - - Error: You want to create vehicle Vehicles\Citaro_K\Citaro_K.bus - it is invalid! 1128 20:08:13 - - Error: You want to create vehicle Vehicles\HH109_Stadtgelenkbus1999_VHH\HHStadtgelenkbus99_main_Krueger+.bus - it is invalid! 1132 20:08:14 - - Information: Actual map closed! Die Map läuft nun (wenigstens etwas). Leider versinken die Kreuzungen im Boden. Und zwar alle, etwa so wie bei Ettbruck, vor dem Patch. Aber wenn ich auf den Link aus der Readme für den Download der Karlstein Objekte gehe, dann wird mir maximal V2.95 und nicht 3.1 angezeigt. Vielleicht bin ich aber ja auch einfach blind..
40 19:46:47 - - Warning: Did not find texture file "30er_reihensiedlung01.bmp"! 41 19:46:47 - - Warning: Did not find texture file "SD_Rad_v.bmp"! 42 19:46:47 - - Warning: Did not find texture file "reifen.bmp"! 58 19:46:48 - - Warning: Did not find texture file "path_car_1.bmp"! 61 19:47:18 - - Warning: Did not find texture file "texture.tga"! 62 19:47:18 - - Warning: Did not find texture file "Snow_1.bmp.001"! 72 19:47:29 - - Error: The file "Sceneryobjects\Waldheini12\Blankwitz\StreetSystem\texture\Fussweg.bmp.cfg" could not be loaded! 73 19:47:29 - - Error: The file "Sceneryobjects\Waldheini12\Blankwitz\StreetSystem\texture\Pflaster_alt.bmp.cfg" could not be loaded! 83 19:47:38 - - Warning: Line "maps\Blankwitz\TTData\28-29.ttl", tour 5011: Entry 24 begins before previous entry ends! 86 19:47:38 - - Warning: Cloudtype "-1" could not be found! 89 19:47:38 - - Information: maps\Blankwitz\global.cfg map loaded! 91 19:47:39 - - Warning: Did not find texture file "logo_default.dds"! 92 19:47:39 - - Warning: Did not find texture file "logo_default.dds"! 93 19:47:39 - - Warning: Did not find texture file "logo_test.dds"! 94 19:47:39 - - Warning: Did not find texture file "logo_test.dds"! 95 19:47:39 - - Warning: Did not find texture file "logo_test.dds"! 96 19:47:39 - - Warning: Did not find texture file "logo_test.dds"! 97 19:47:41 - - Warning: Did not find texture file "text.bmp"! 102 19:47:44 - - Warning: Did not find texture file "StrSchild_Text1.bmp"! 103 19:47:45 - - Warning: Did not find texture file "StrSchild_Text1.bmp"! 104 19:47:45 - - Warning: Did not find texture file "StrSchild_Text1.bmp"! 105 19:47:45 - - Warning: Did not find texture file "StrSchild_Text1.bmp"! 106 19:47:46 - - Warning: Did not find texture file "text.bmp"! 107 19:47:46 - - Warning: Did not find texture file "text.bmp"! 108 19:47:46 - - Warning: Did not find texture file "text.bmp"! 110 19:47:48 - - Warning: Did not find texture file "Werbung.dds"! 111 19:47:48 - - Warning: Did not find texture file "Werbung.dds"! 113 19:47:50 - - Warning: Did not find texture file "textfeld.bmp"! 114 19:47:50 - - Warning: Did not find texture file "textfeld.bmp"! 115 19:47:50 - - Warning: Did not find texture file "textfeld.bmp"! 116 19:47:50 - - Warning: Did not find texture file "textfeld.bmp"! 117 19:47:51 - - Warning: Did not find texture file "textfeld.bmp"! 118 19:47:51 - - Warning: Did not find texture file "WegweiserChange.dds"! 119 19:47:51 - - Warning: Did not find texture file "WegweiserChange.dds"! 120 19:47:51 - - Warning: Did not find texture file "WegweiserChange.dds"! 121 19:47:51 - - Warning: Did not find texture file "WegweiserChange.dds"! 126 19:47:54 - - Warning: Did not find texture file "logo_test.dds"! 127 19:47:54 - - Warning: Did not find texture file "logo_test.dds"! 129 19:47:57 - - Warning: Did not find texture file "logo_test.dds"! 130 19:47:57 - - Warning: Did not find texture file "logo_test.dds"! 131 19:47:57 - - Warning: Did not find texture file "logo_test.dds"! 132 19:47:57 - - Warning: Did not find texture file "logo_test.dds"! 133 19:47:57 - - Warning: Did not find texture file "logo_test.dds"! 134 19:47:57 - - Warning: Did not find texture file "logo_test.dds"! 135 19:47:57 - - Warning: Did not find texture file "textfeld.bmp"! 136 19:47:57 - - Warning: Did not find texture file "textfeld.bmp"! 137 19:47:57 - - Warning: Did not find texture file "textfeld.bmp"! 138 19:47:57 - - Warning: Did not find texture file "textfeld.bmp"! 139 19:47:57 - - Warning: Did not find texture file "textfeld.bmp"! 140 19:47:57 - - Warning: Did not find texture file "textfeld.bmp"! 141 19:47:57 - - Warning: Did not find texture file "textfeld.bmp"! 142 19:47:57 - - Warning: Did not find texture file "WegweiserChange.dds"! 143 19:47:57 - - Warning: Did not find texture file "WegweiserChange.dds"! 144 19:47:57 - - Warning: Did not find texture file "WegweiserChange.dds"! 145 19:47:57 - - Warning: Did not find texture file "WegweiserChange.dds"! 146 19:47:57 - - Warning: Did not find texture file "AnzChange.dds"! 147 19:47:57 - - Warning: Did not find texture file "AnzChange.dds"! 148 19:47:57 - - Warning: Did not find texture file "AnzChange.dds"! 149 19:47:57 - - Warning: Did not find texture file "AnzChange.dds"! 150 19:47:57 - - Warning: Did not find texture file "text.bmp"! 159 19:48:00 - - Warning: Did not find texture file "textfeld.bmp"! 175 19:48:00 - - Warning: Terrain hole cutting: Spline Splines\Waldheini12\Blankwitz\Gehweg_3,3.sli has invalid hole polygon(s)! 197 19:48:02 - - Warning: Terrain hole cutting: Spline Splines\Waldheini12\Blankwitz\Gehweg_3,3.sli has invalid hole polygon(s)! 204 19:48:03 - - Warning: Terrain hole cutting: Spline Splines\Waldheini12\Blankwitz\Gehweg_3,3.sli has invalid hole polygon(s)! 206 19:48:04 - - Warning: Terrain hole cutting: Spline Splines\Waldheini12\Blankwitz\Gehweg_3,3.sli has invalid hole polygon(s)! 210 19:48:07 - - Warning: Terrain hole cutting: Spline Splines\Waldheini12\Blankwitz\Gehweg_3,3.sli has invalid hole polygon(s)! 211 19:48:10 - - Warning: Terrain hole cutting: Spline Splines\Waldheini12\Blankwitz\Gehweg_3,3.sli has invalid hole polygon(s)! Endlich mal einer der dieses Probem auch hat. Ich dachte ich wär der einzige, wunderte mich schon! Die Kreuzungen, das ist auch einmal im Betatest aufgetreten. Allerdings kann ich weder eine Ursache finden noch den Fehler auf irgendeinem meiner PCs reproduzieren - das scheint völlig zufällig aufzutreten. Ein Patch wie bei Ettbruck geht diesmal aber nicht, weil das Terraincutting einfach gebraucht wird - bei Ettbruck konnte ich das verhindern, weil die Kreuzungen flach waren. Besteht das Problem wirklich bei allen Kreuzungen? Und, wenn die Kreuzung auf einer leeren Karte platziert und mittels Terraincutting im Boden versenkt wird, tritt dann der selbe Fehler auf? Edit: und auf was für Systemen kommt das vor? Ich habe diesen Problem, auch. Trotz dass ich Betatester bin. Ich hab Waldheini12 auch schon angeschrieben. Ich denke er wird es noch patchen. Edited once, last by Anton ( Dec 7th 2016 ). mehrmals Neuinstalliert, beide Downloads ausprobiert, hilft nix. Hab mir im Editor ganz bauernhaft mal das Terrain nach unten gesetzt, das geht aber in der Tunnelverbindung unterhalb der Linie 28 nicht ohne dass es komplett scheiße aussieht. Gibt es überhaupt die Funktion etwas durch Terrain zu schneiden so das oben wieder Terrain ist? Hab das nicht gefunden ( wegen dem Tunnel unter der 28). Theoretisch kann man das Terrain an gewünschte Objekte und Splines anpassen. Leider bringt das in diesem Fall nix, sondern macht alles noch schlimmer. Liegt es an mir oder ist der Fahrplan dieser Linie wirklich so undurchsichtig. Ich hab mir die Faht van 15:08 aus Umlauf 5811 gewählt. 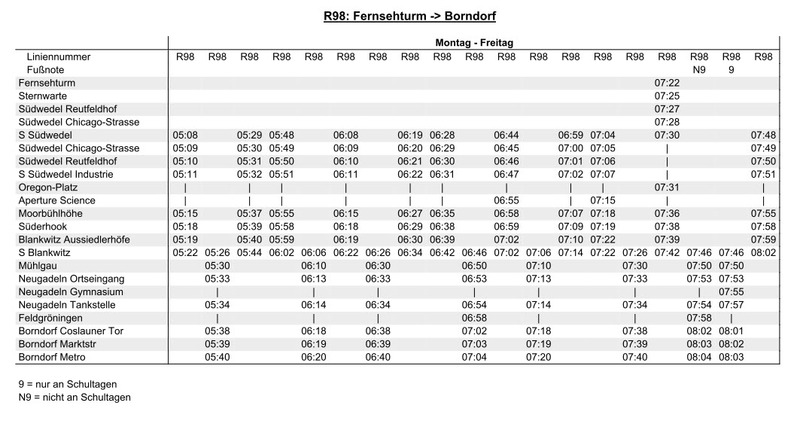 Laut Fahrplan färt die von S Südwedel nach S Blankwitz. Dazu habe ich leider keine Route gefunden. Es gibt nur durchgehende Routen von Südwedel nach Borndorf mit viele Variationen. Is gebt schliesslich nur 64 unterschidliche Routen in die HOF-Datei für die R98.